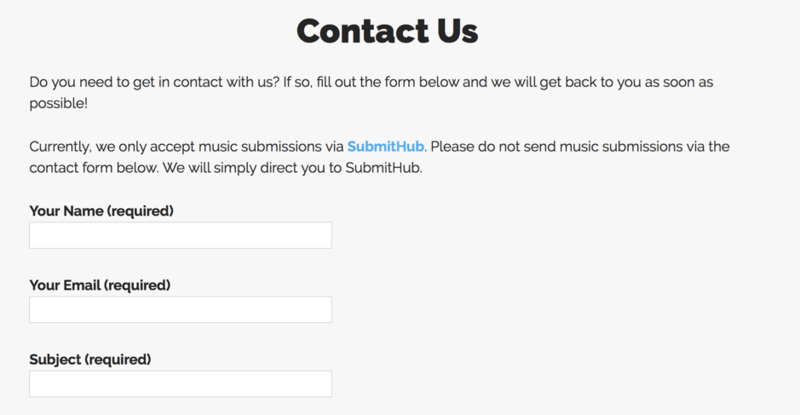 How many blogs to submit music to are you familiar with? 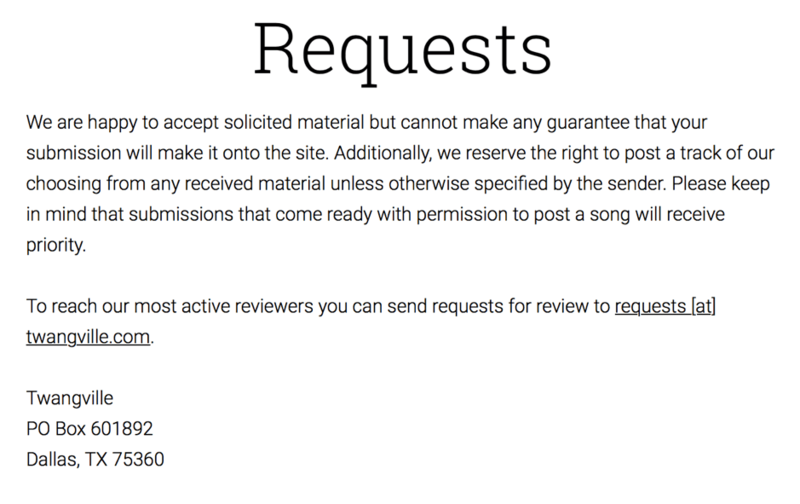 I was familiar with just a handful of blogs until I decided to work on a list which I can submit my music to. 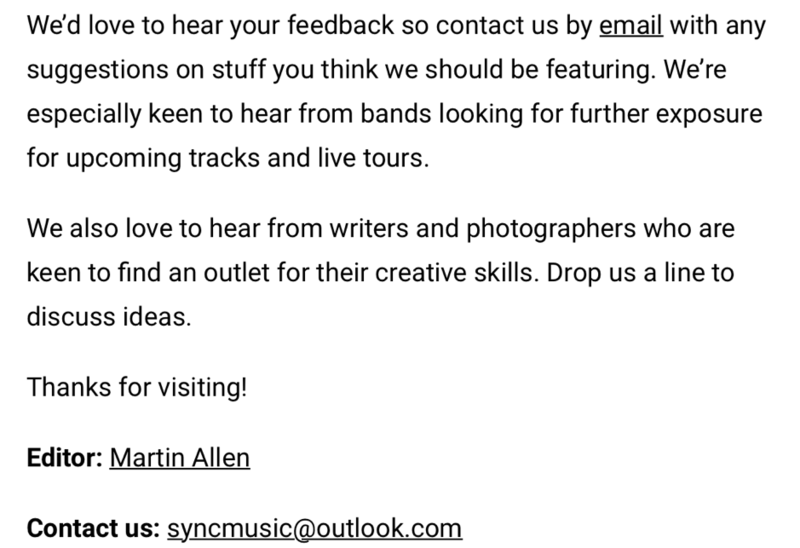 If you are like me, you want to get your music heard. 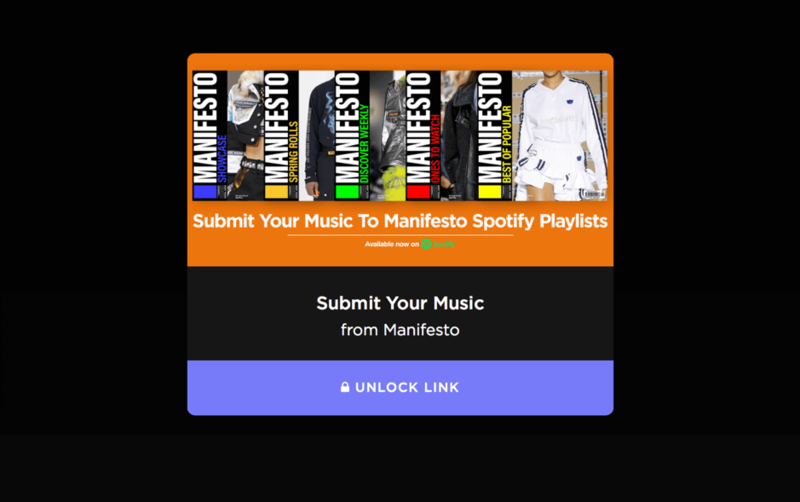 You want your music to connect with people. 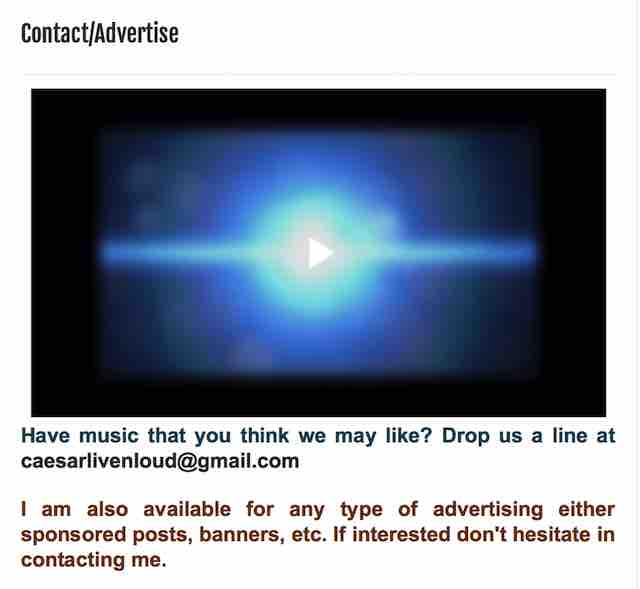 You want your music to reach a wide audience. 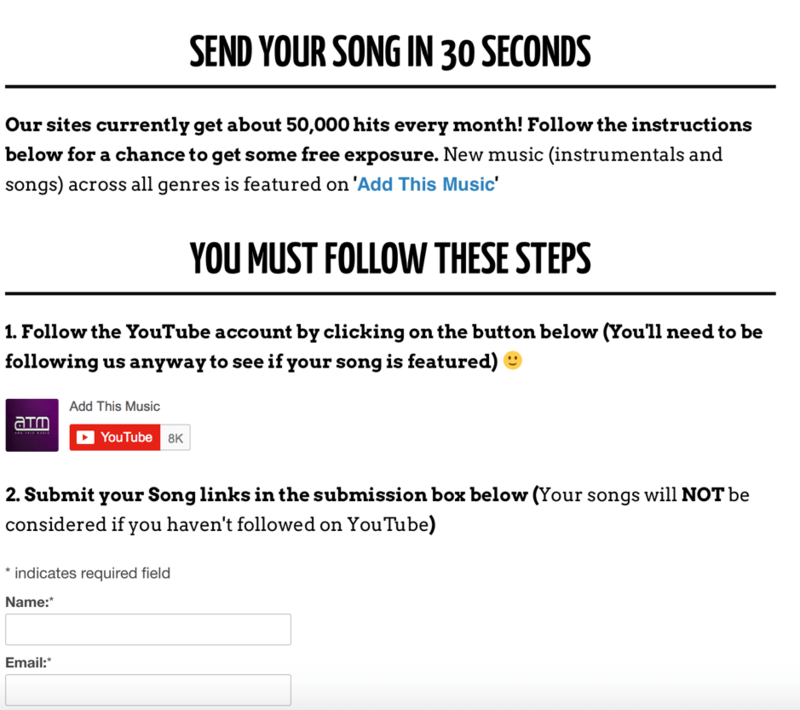 You want to build a base of fans that wait for your next song or show. 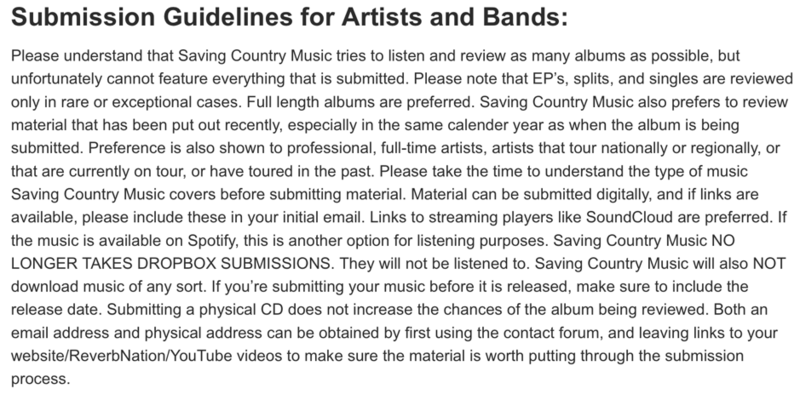 And yes, at some point, you also want to make money from your music. 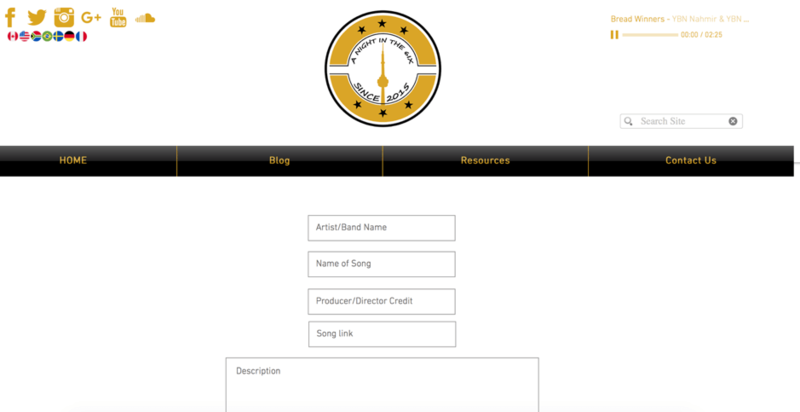 Because let’s face it … as much as you love to write songs, you can’t do it for 24 hours. You need to pay your bills. But here’s the thing … it’s challenging. 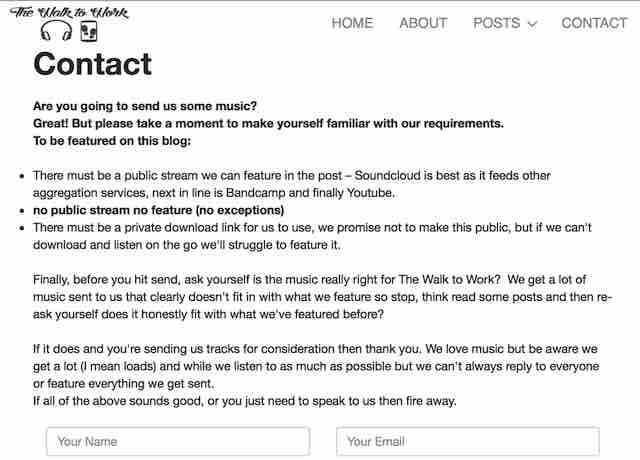 It’s not easy to get your music heard. It’s even harder to get it heard by the right people. People who succeed take action. 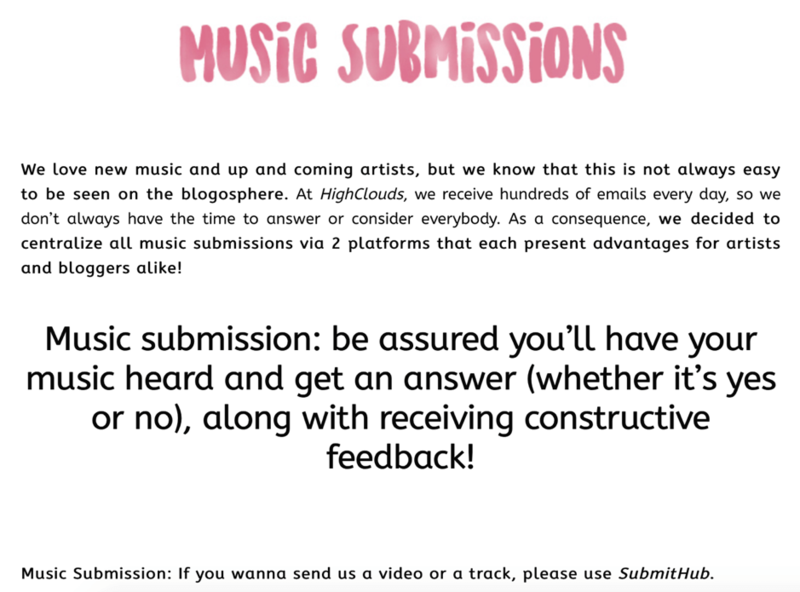 In order to help you, I worked hard on a long list of 222 music blogs which you can submit your music to. 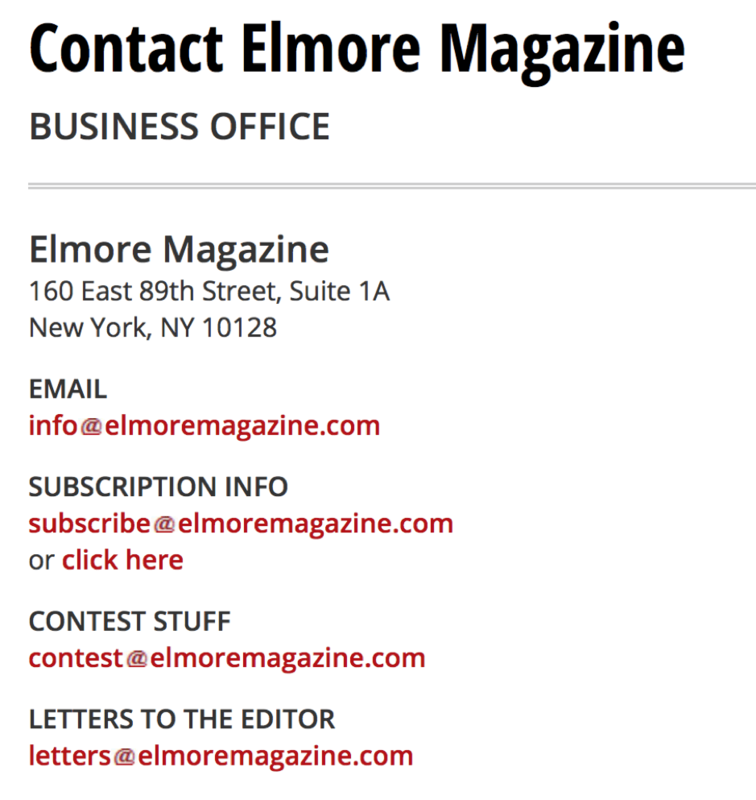 You can filter through the list to find the best blogs for you. 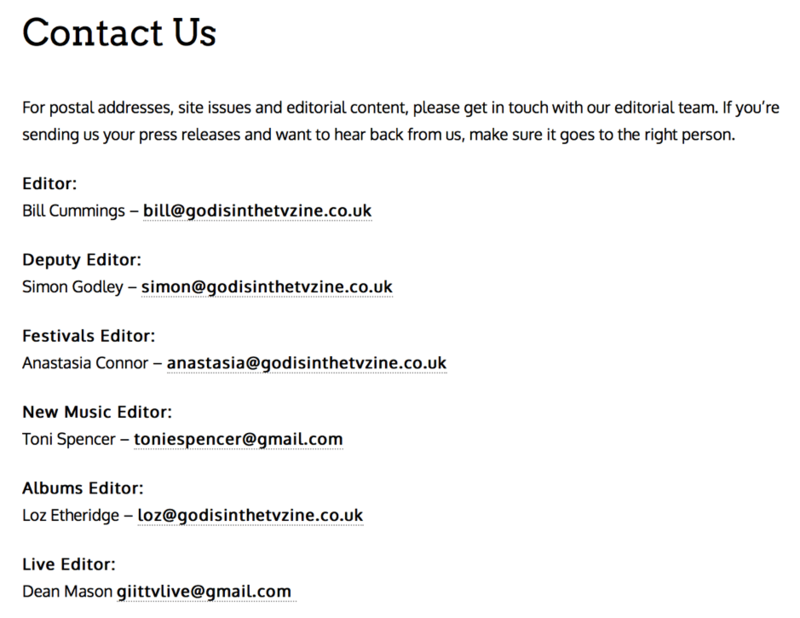 The blogs are listed in alphabetical order. The first thing I noticed when I entered A Little Bit Louder is the wide coverage of new releases. 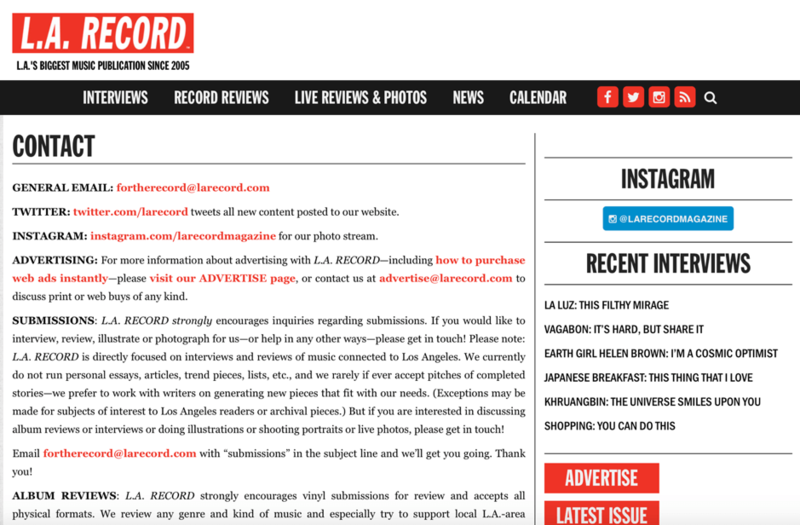 This LA based blog introduces artists and bands from many musical genres. 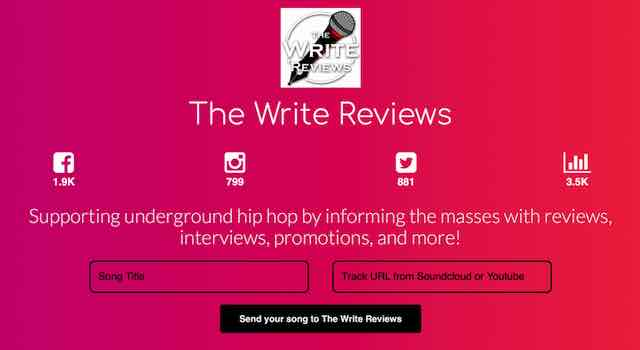 The writers mostly review singles. Genres: Rap, Hip Hop, Pop, EDM, House, Funk, Chill, & RnB. 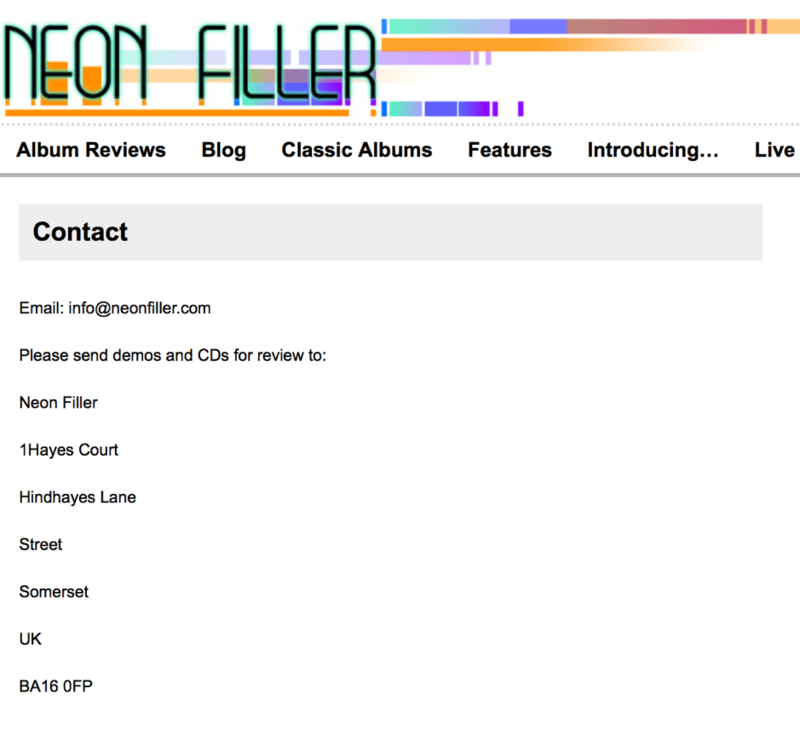 Adobe and Teardrops is a music review website. It started in 2011 and covers music from all around the world. 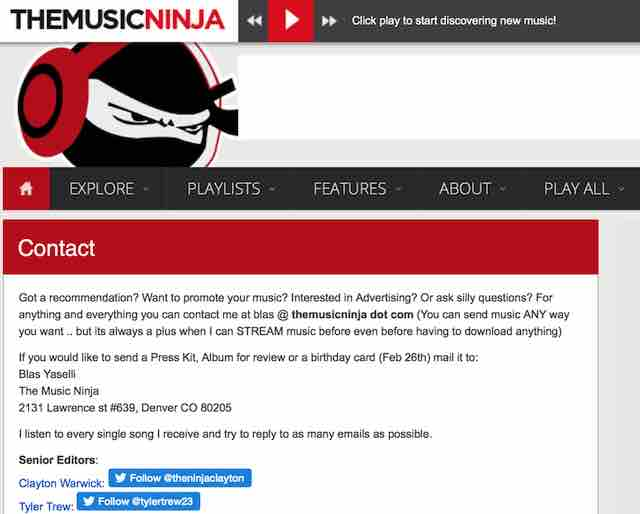 It has music reviews, a podcast and a section on the website where you can download free music. 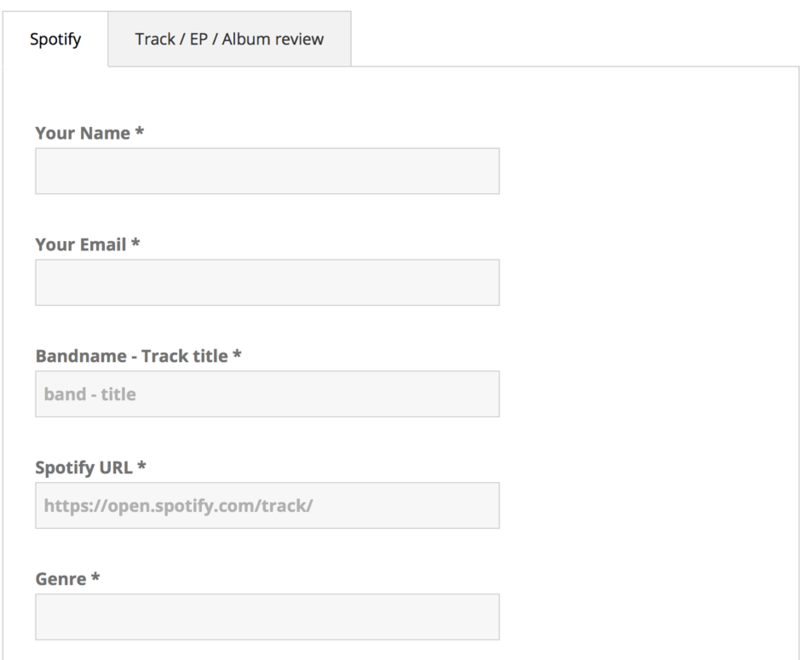 In addition, you can purchase songs of musicians who sell their music for less than 10$. 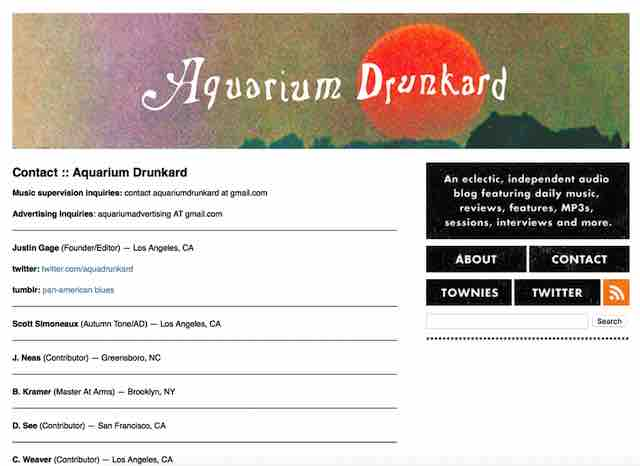 Aquarium Drunkard is music blog that is based in Los Angeles. It started in 2005 and features reviews, interviews and more. 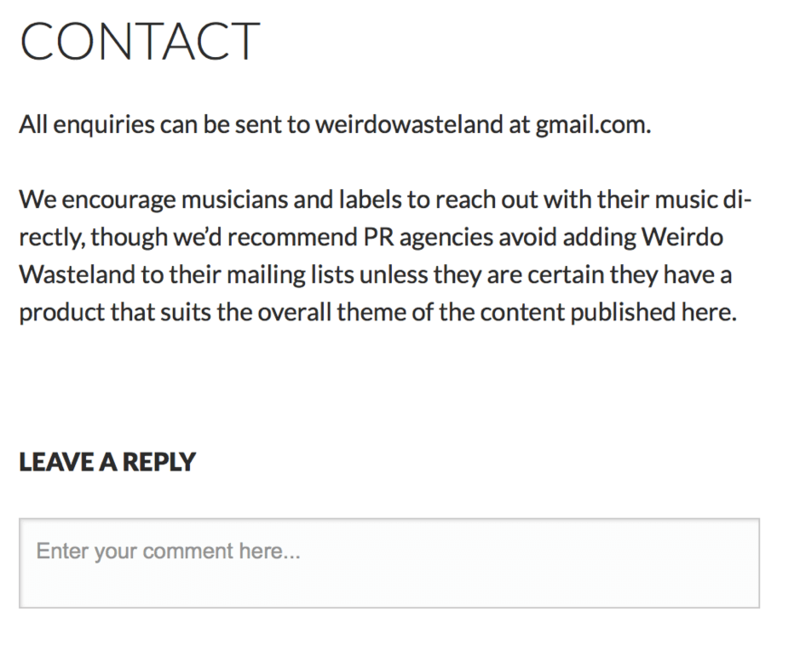 Every two weeks Aquarium Drunkard’s writers send a newsletter to their readers inboxes. 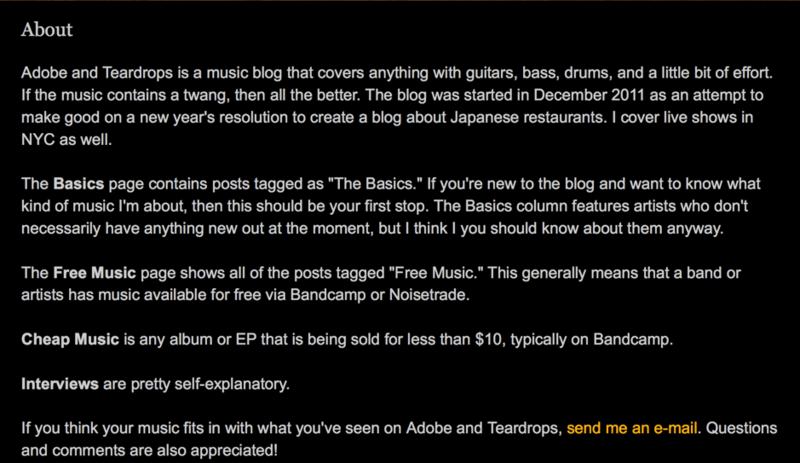 BeatRoute Magazine is more than a music blog. Genres: Celtic Punk, Celtic Rock and Folk Punk. 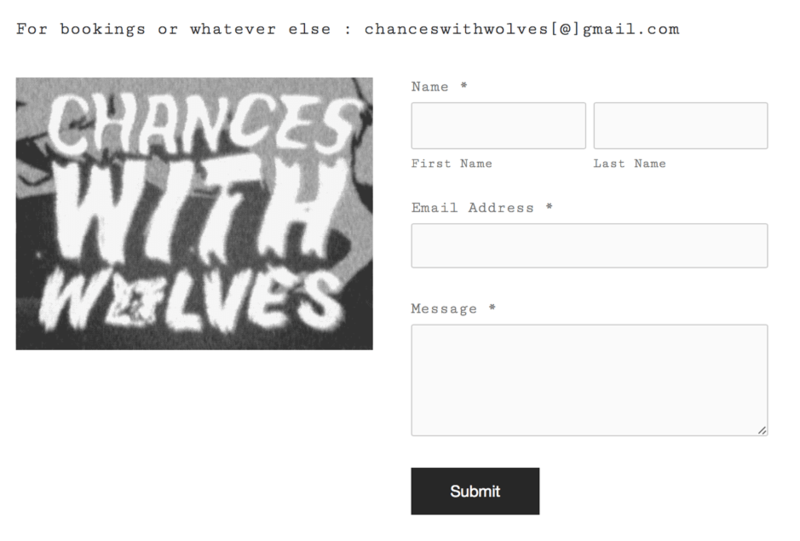 When I entered Chances with The Wolves I couldn’t help but notice the website’s recurring visual theme: wolves. Nice. Music is just one of Conversations About Her’s many topics of coverage. 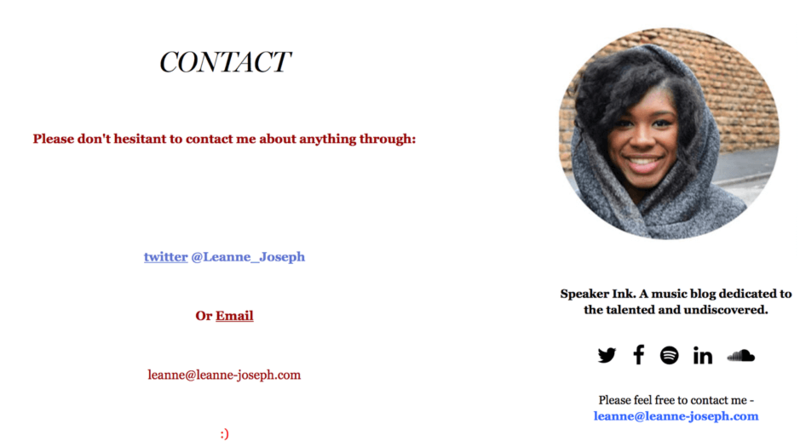 The website has sections on film, TV, fashion, lifestyle, arts and even politics. 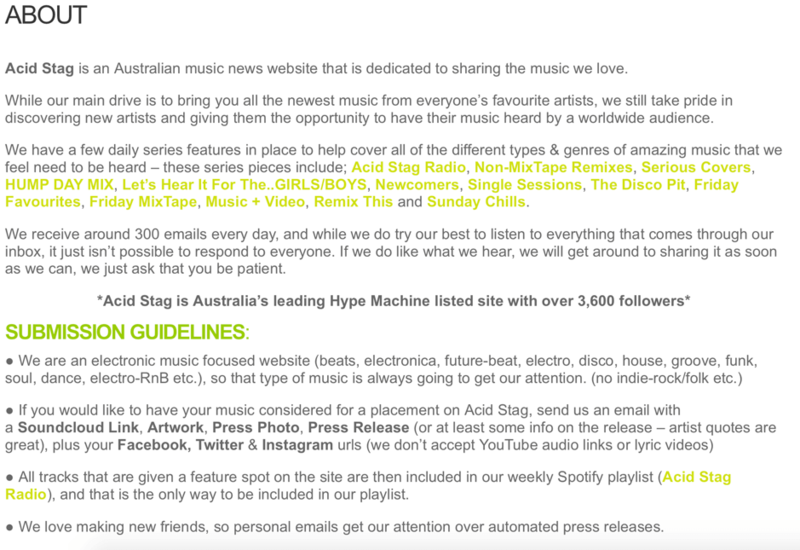 With regards to music, the site’s aim is to spotlight the best new and emerging music from all around the world. 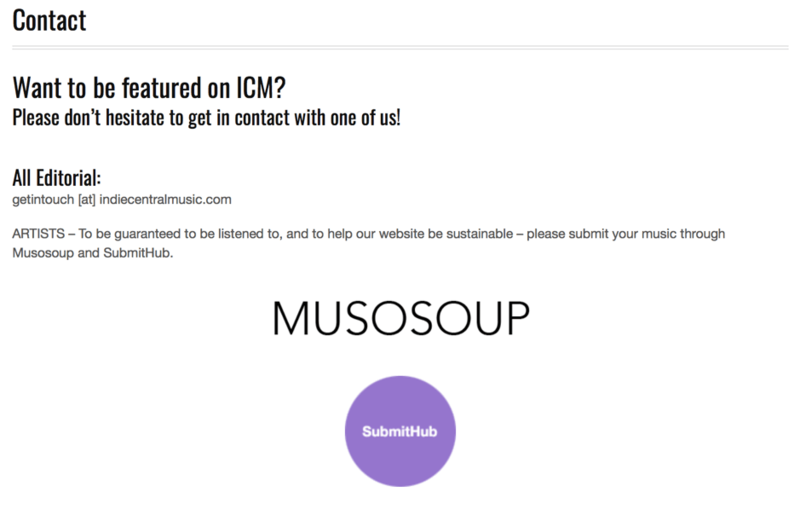 Cougar Microbes is a UK based music blog. 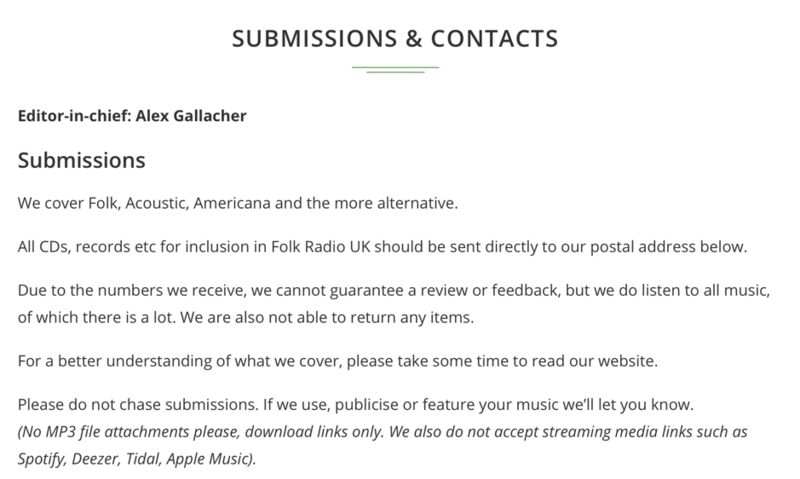 It mainly focuses on music from the British scene but also covers music from around the world. 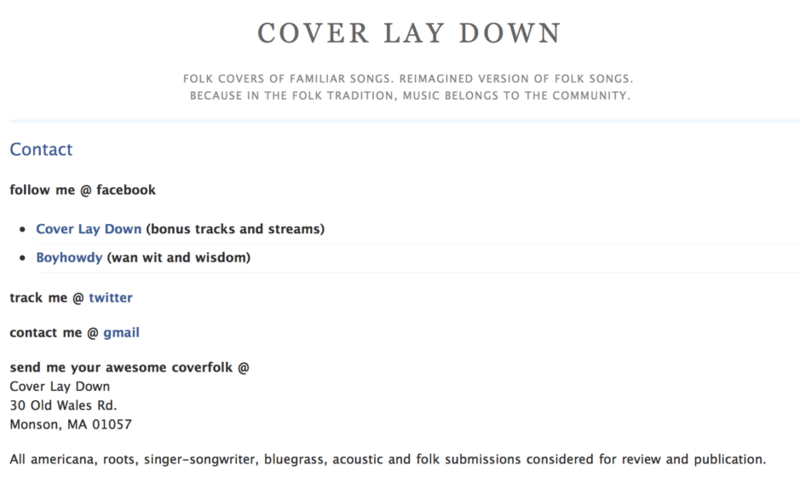 Cover Lay Down is a bit different from most of the music blogs out there. 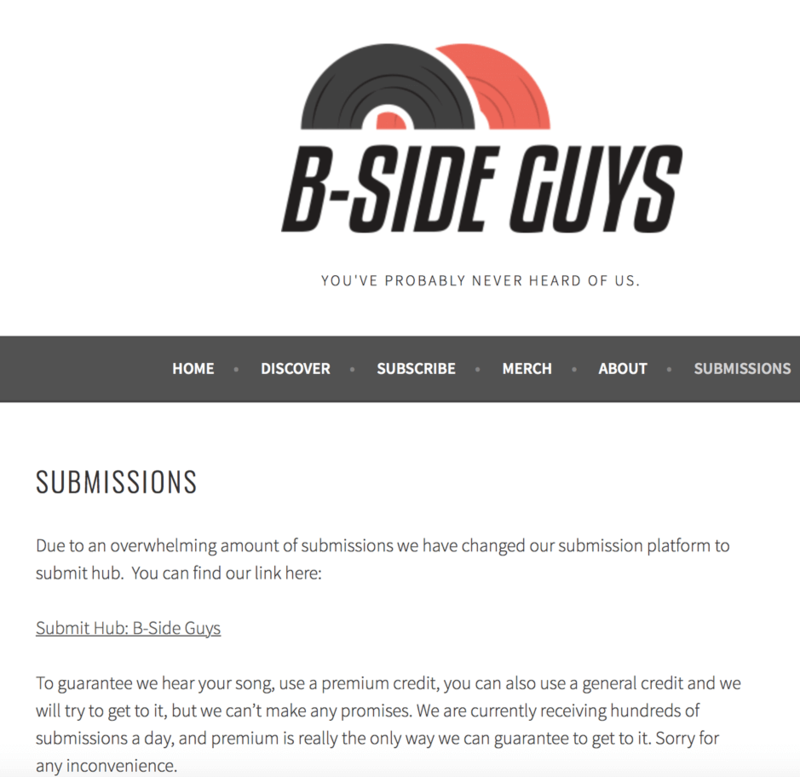 Unlike most blogs, this blogs features covers and not original music. 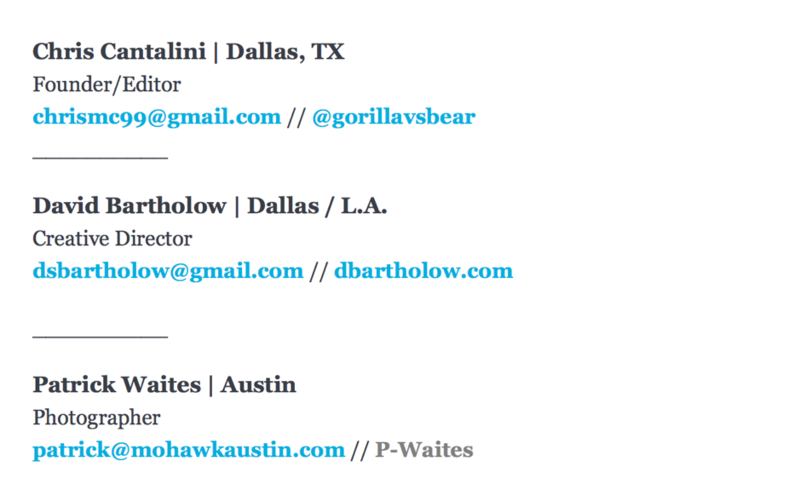 What’s really cool about Digital Tour Bus is that it is all about touring musicians. 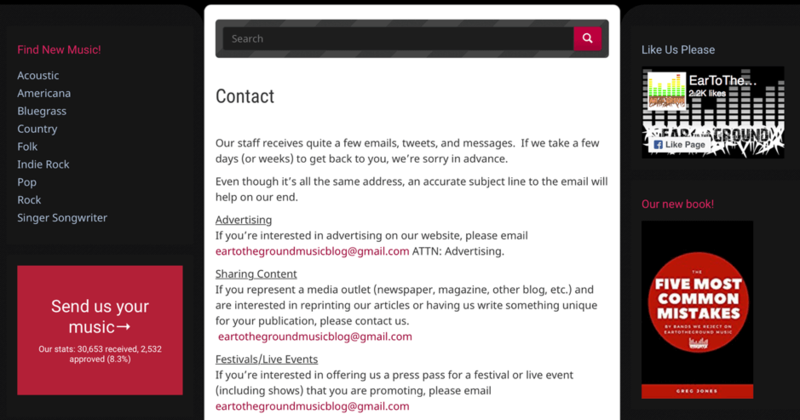 The website has a number of sections that are all dedicated to exploring the touring musicians’ world. 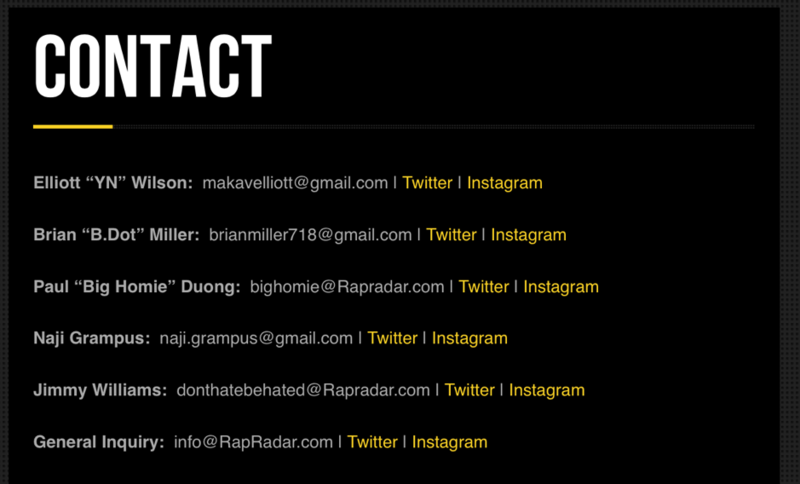 DJbooth is a comprehensive Hip Hop music blog. 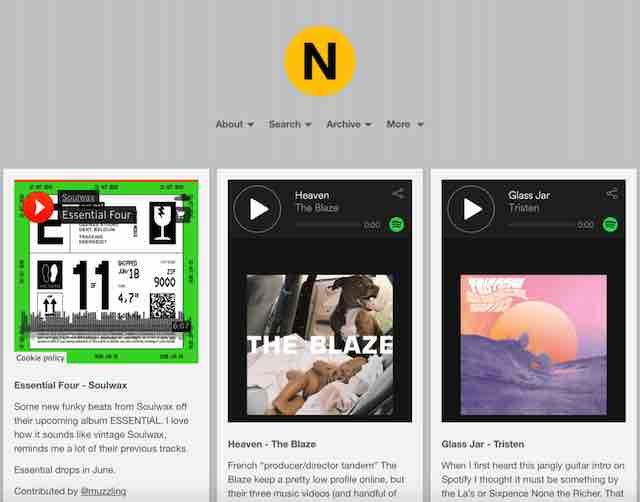 There is a lot of stuff covered in this blog: news, a very interesting “opinion” section where you can find opinions on various topics, interviews with featured artists, Hip Hop charts, song reviews and more. 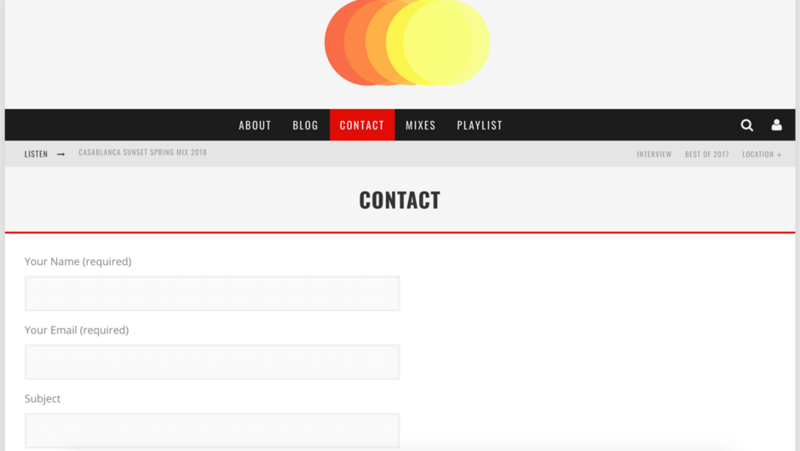 Disco Naïveté is a Belgium-based music blog that was founded in 2009.
dlnw. 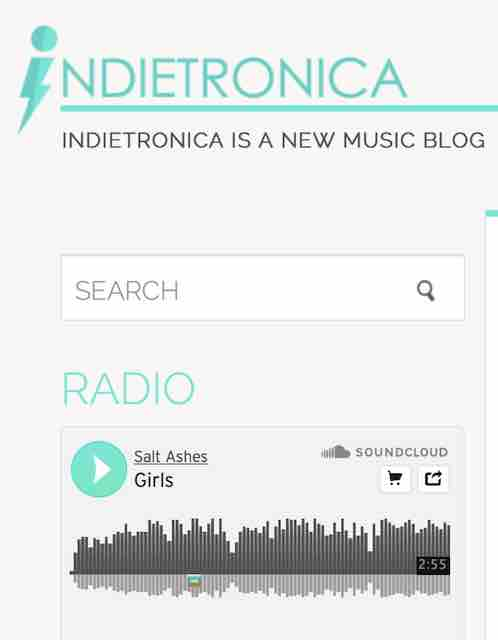 is a music blog that covers electronic and indie music. 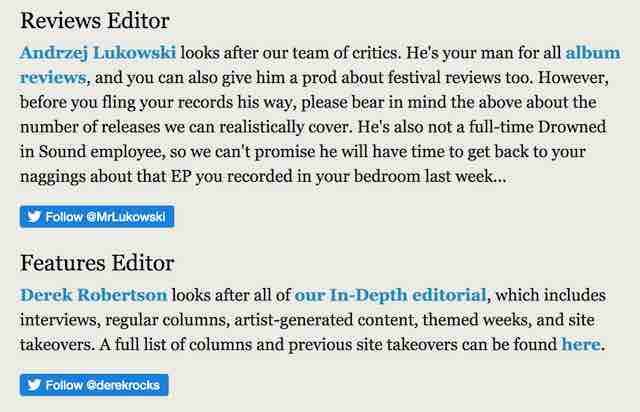 Here is a section I didn’t come across on so many music websites: articles dedicated to review music festivals. 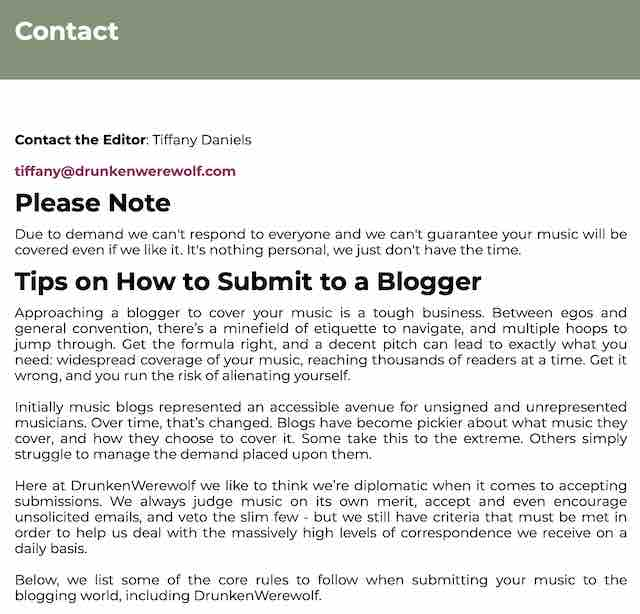 DrunkenWerewolf is a UK based website that was founded in 2005. 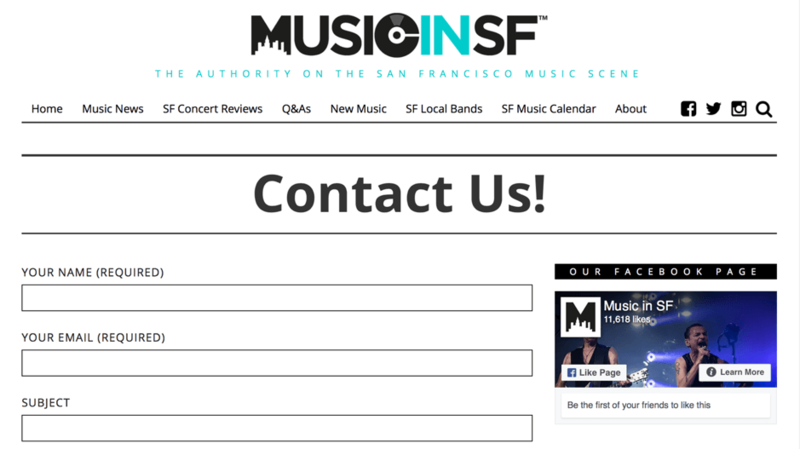 It supports all the types of musicians: unsigned artists along more established musicians. 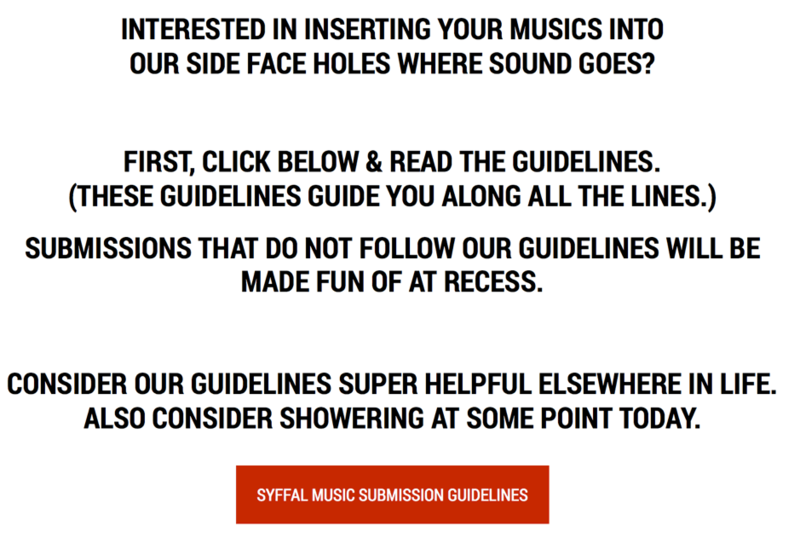 It has a section dedicated to introduce musicians to its readers. 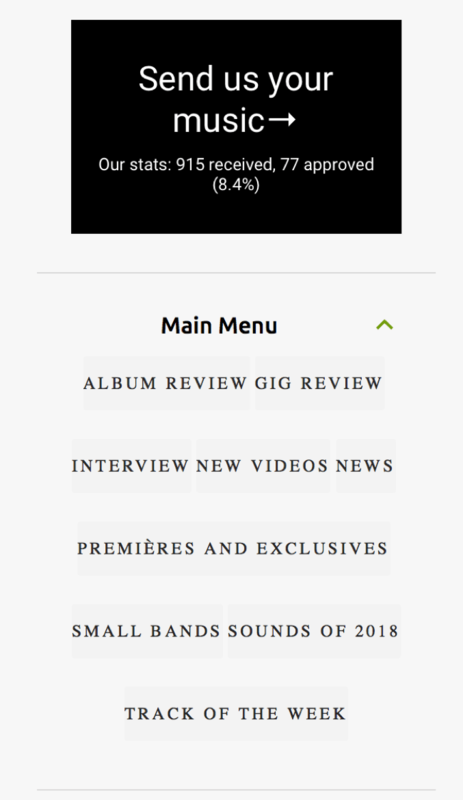 It also features albums, EP and live reviews. 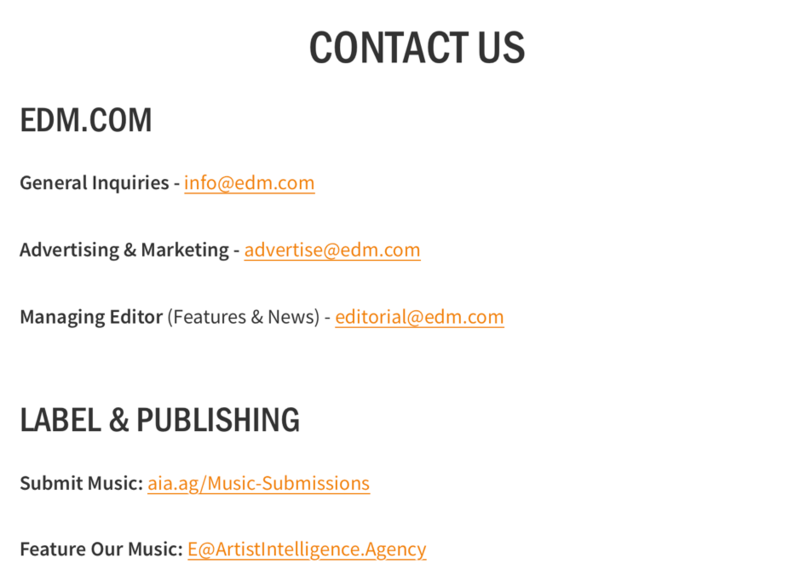 EDM.com is a great source for information on EDM. 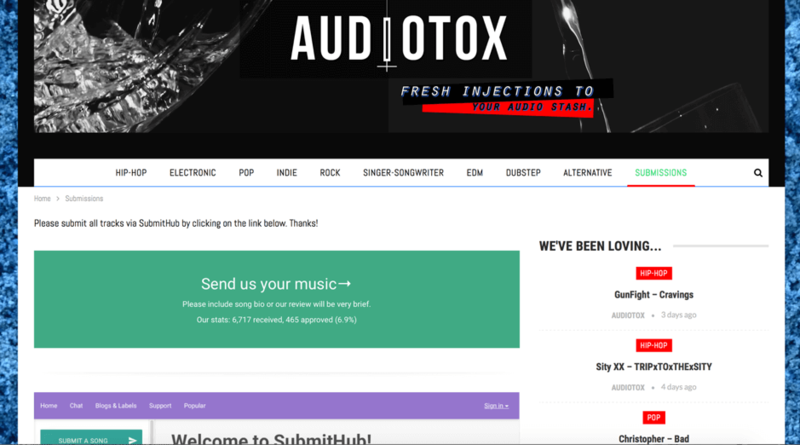 If you’re looking for a music blog that covers a wide variety of songs from across the globe, look no further: Emerging Indie Bands covers Africa, Asian, Australian, European, North American and South American music. 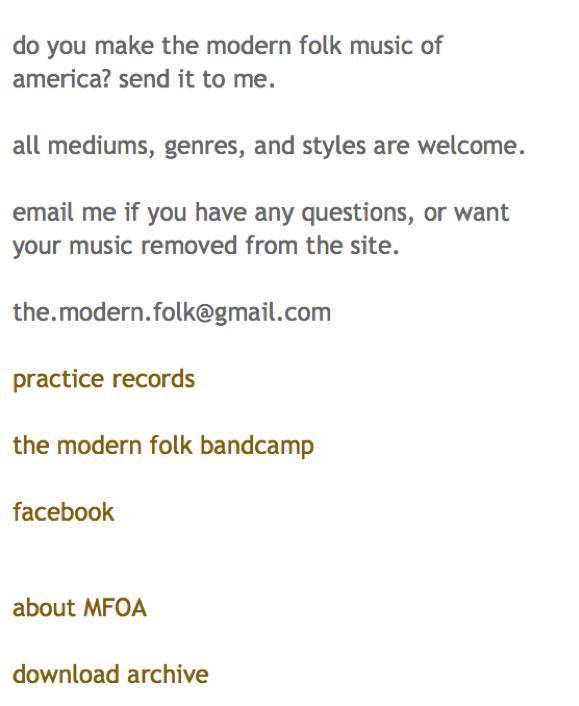 Folk Alley.com is the first website that I submitted my songs to. 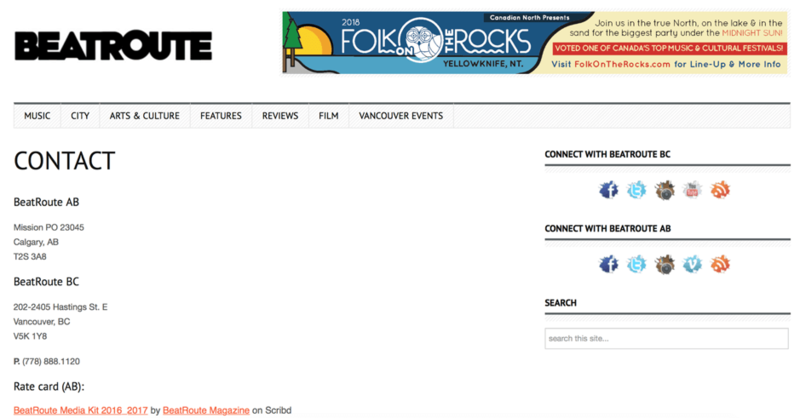 What drew me to FolkAlley was the wide coverage of folk music. 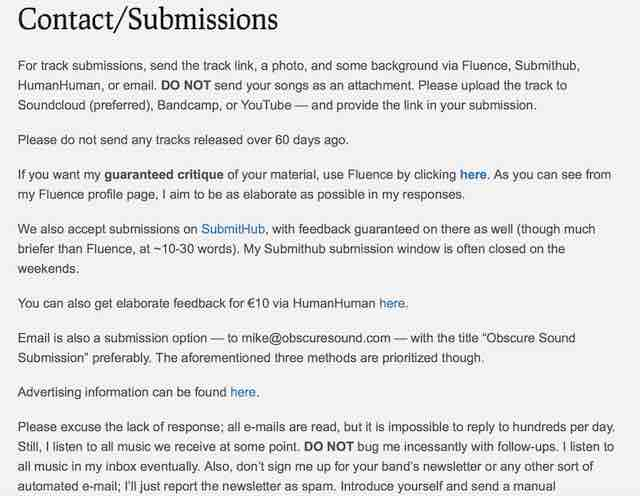 What I also liked was that I had my own unique artist page on the website where I could submit songs to. 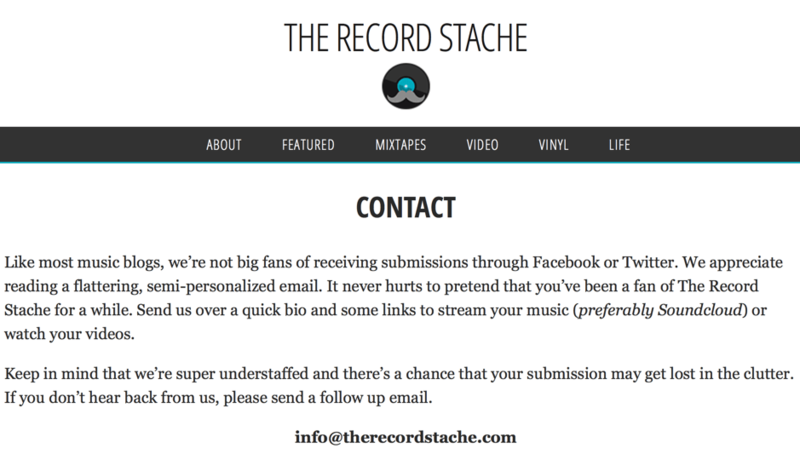 The name of this website is very cool: For Folk’s Sake. 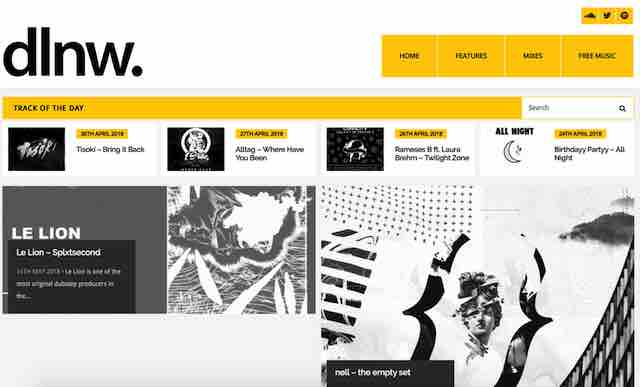 Founded by Sam Cottis, For the Rabbit’s main page features a gallery of artists’ photos which instantly got me curious about their music. 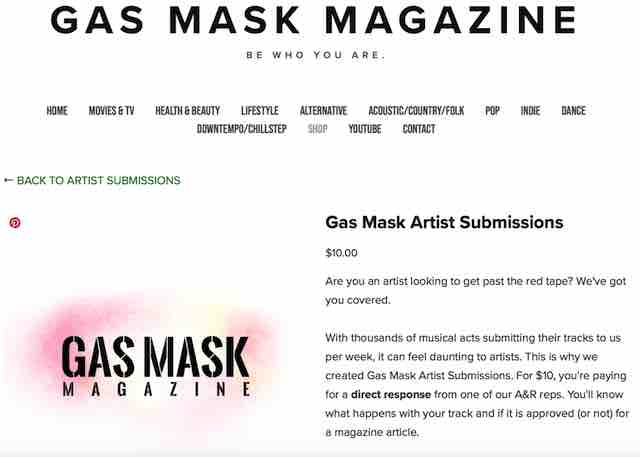 Gas Mask Magazine is a digital magazine that is more than a music blog. 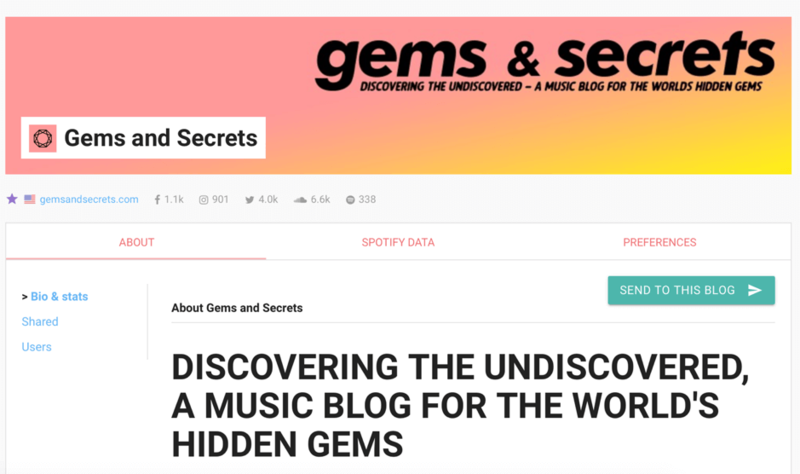 Gems & Secrets’ article titles are really cool, in my opinion: “Extremely bad man shares insane new single; “Up With the Birdies” or “We’re slightly obsessed with Out There’s and Ella Poletti’s ‘What to Do”. 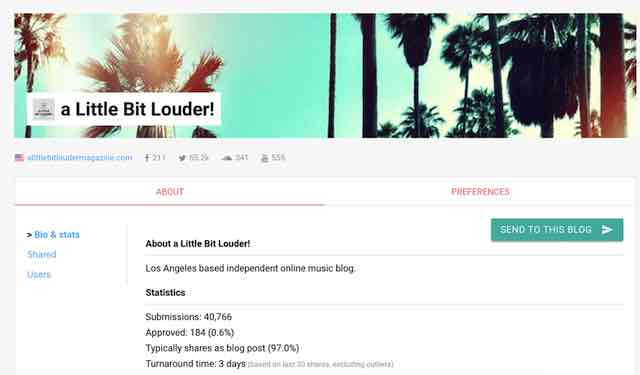 Gig Goer is a music blog that was founded by Kasia Osowiecka in 2015. 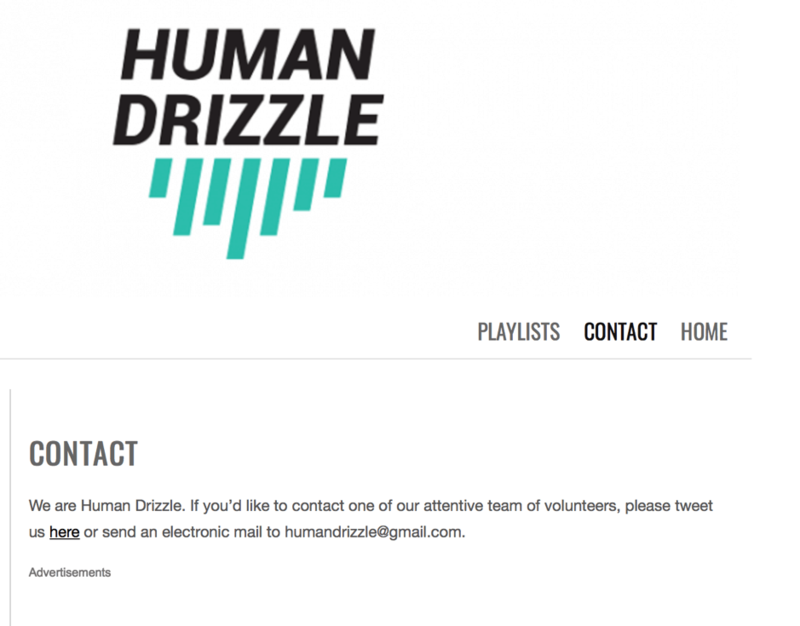 Highclouds started as a web radio in 2005. 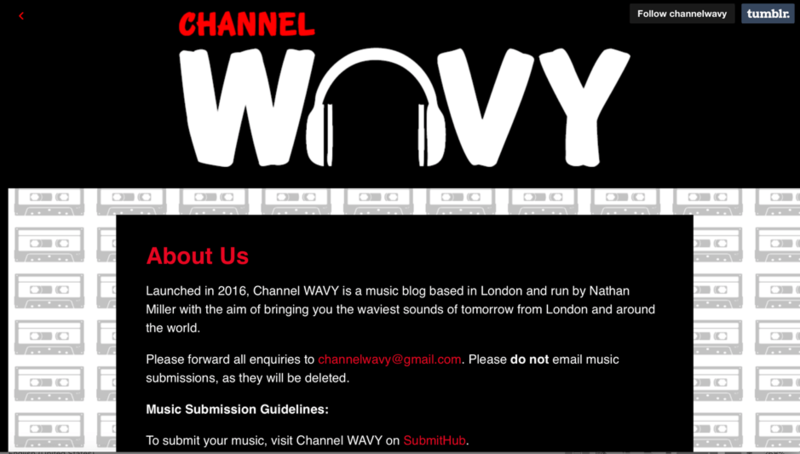 It has gradually turned into a music blog that focuses on reviewing music. 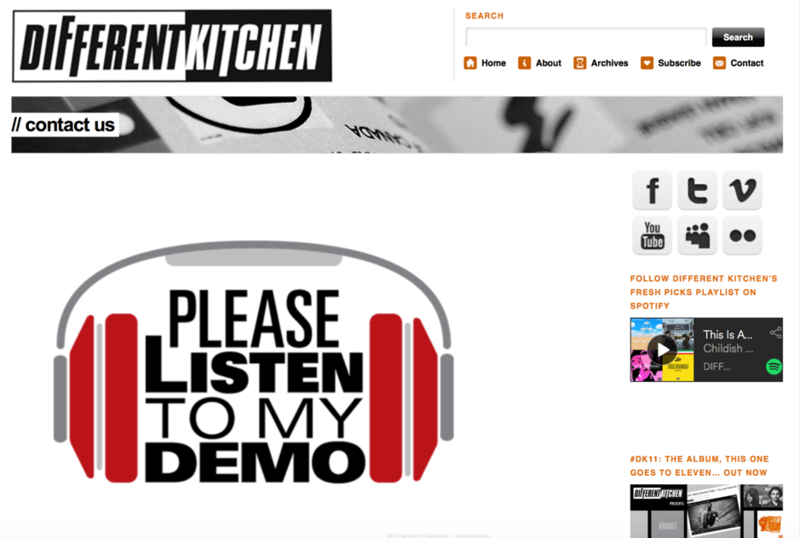 The blog has album reviews, EP reviews, track reviews and video reviews of artists they like. 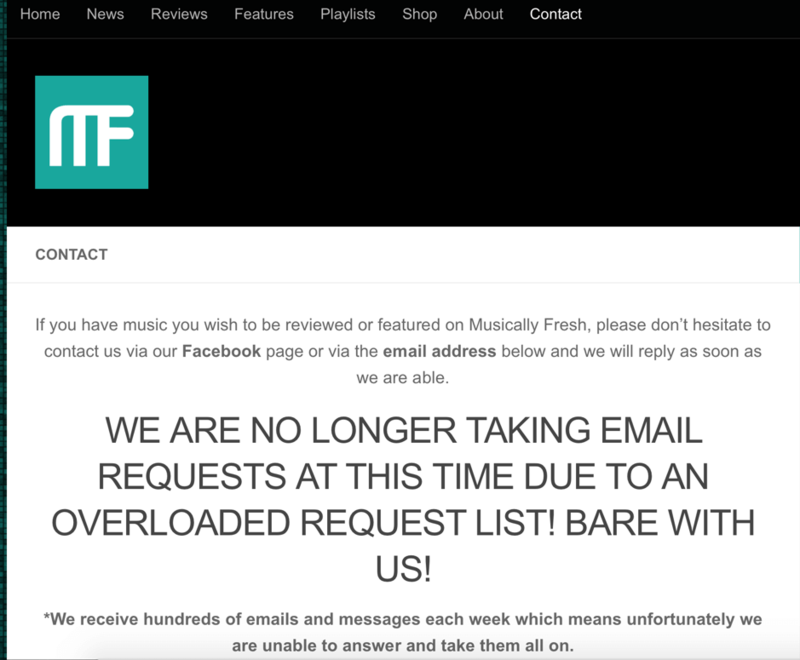 Here’s what you won’t find on I Am Tuned Up: articles covering old band drama news, summaries of press releases and reviews of artists who are not really serious about their craft. 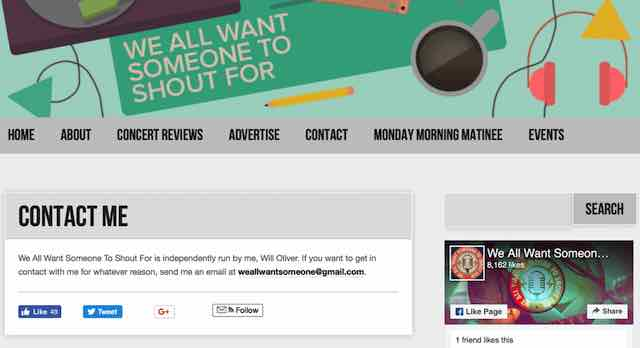 This cool blog was founded by Alex Pearson and is led by three other senior editors: Adam Hamza, George O’dell and Stephen McMahon. 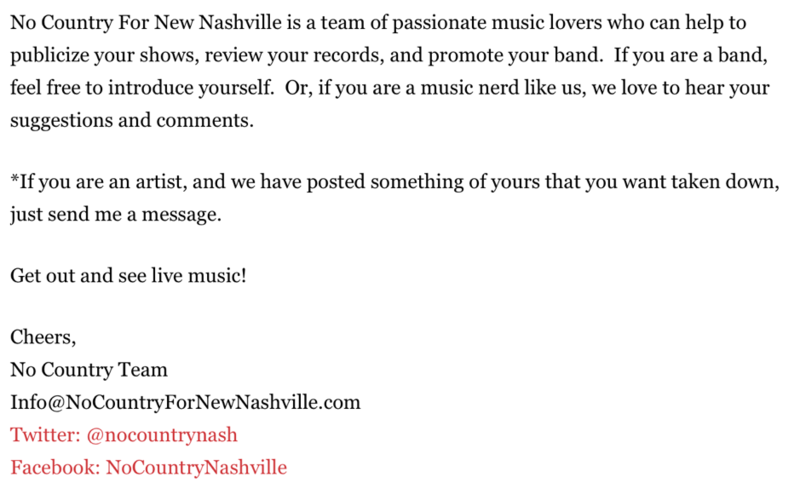 This passionate team presents news, interviews, music reviews, monthly discovery of artists and more. 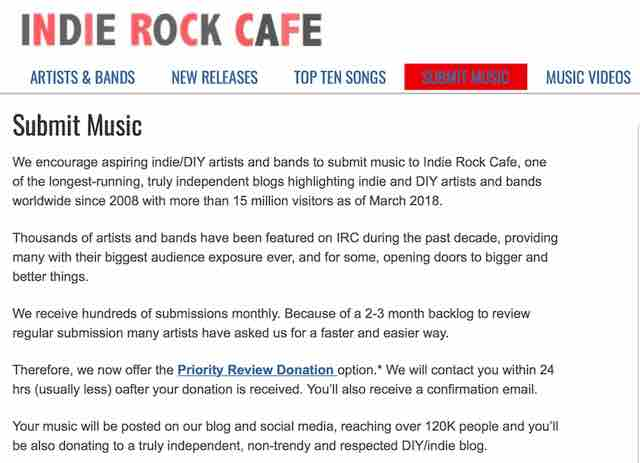 Indie Folk Central was founded by an avid music fan called Rufus in 2012. 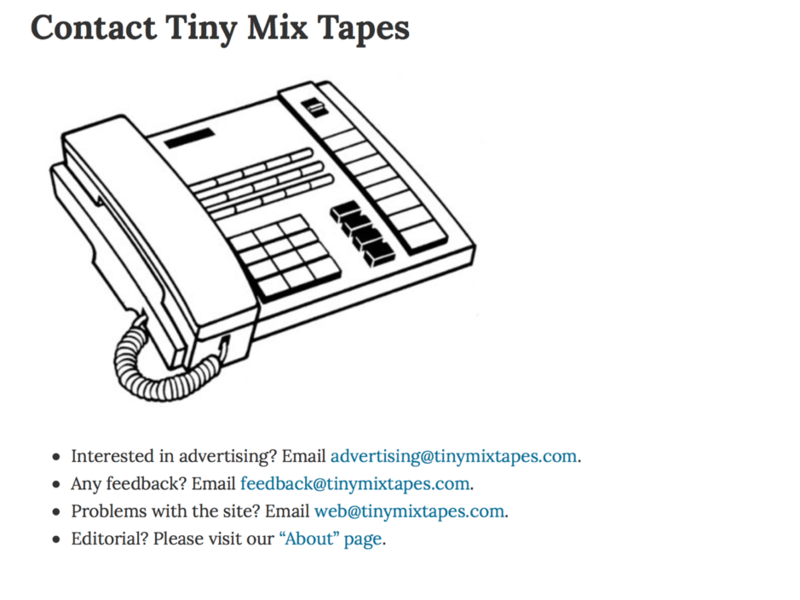 Back then, it operated solely on YouTube and SounCloud. 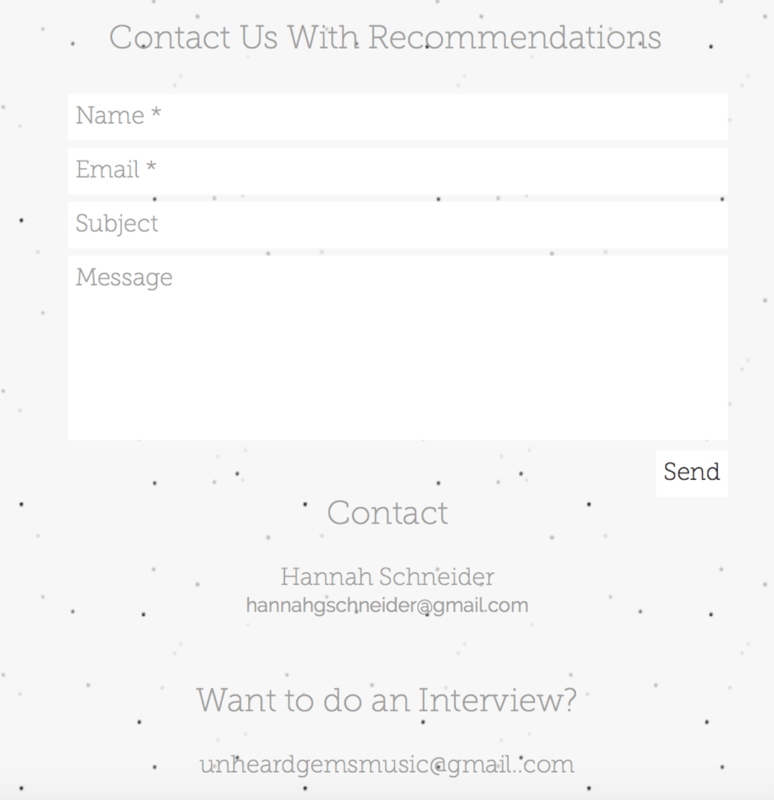 Today, this music blog brings forth some of the best undiscovered folk music. 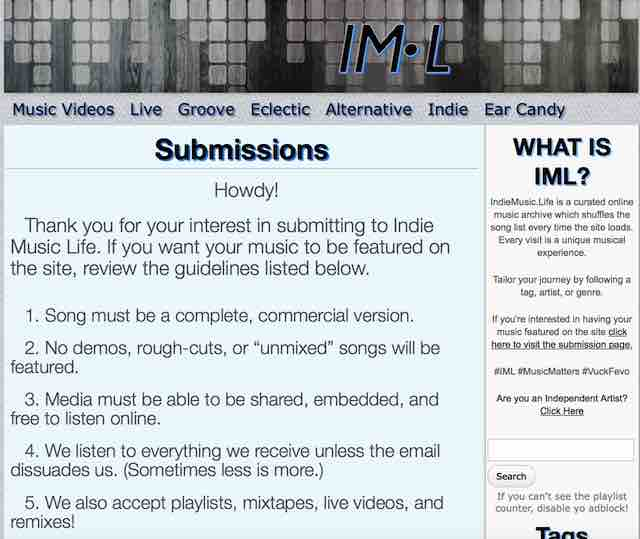 Indie Music Life is a website dedicated to curating music. 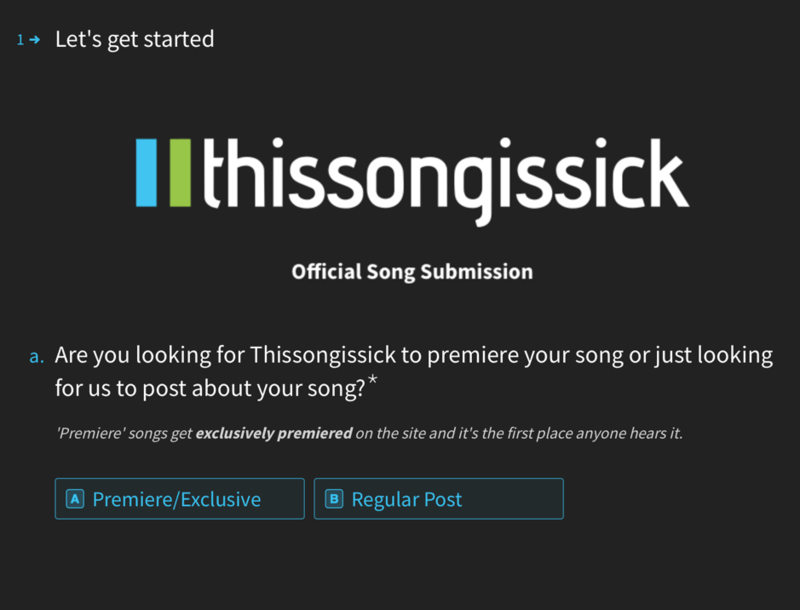 It has a very cool and unique feature on this website: every time you load the site it will shuffle the playlist and introduce you to new songs. 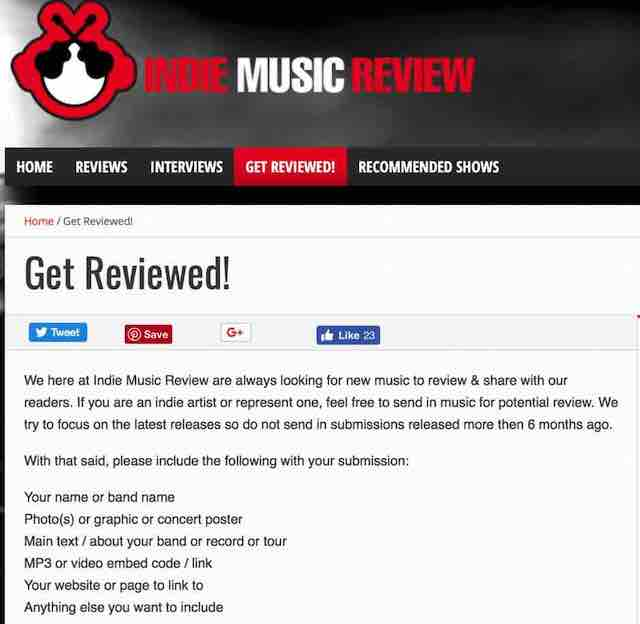 On Indie Music Review you’ll find all of the types of reviews: album, EP, singles, videos and shows. 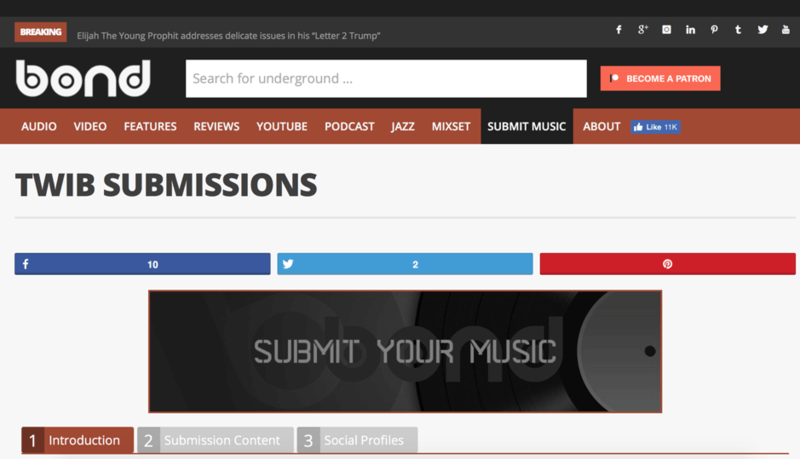 This New York based music blog’s goal is to showcase indie artists from all over the globe. 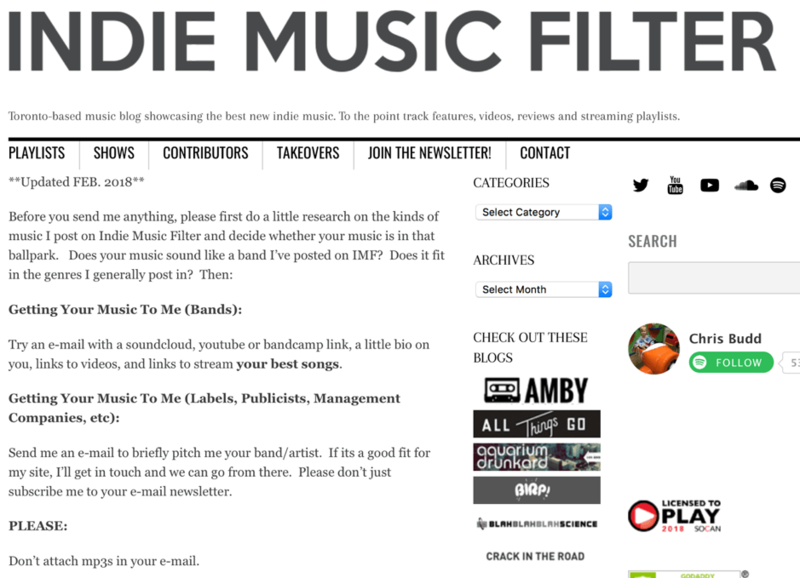 Indie Shuffle is a website where new songs and playlists are featured and analyzed. This is a great site to explore different types of genres. 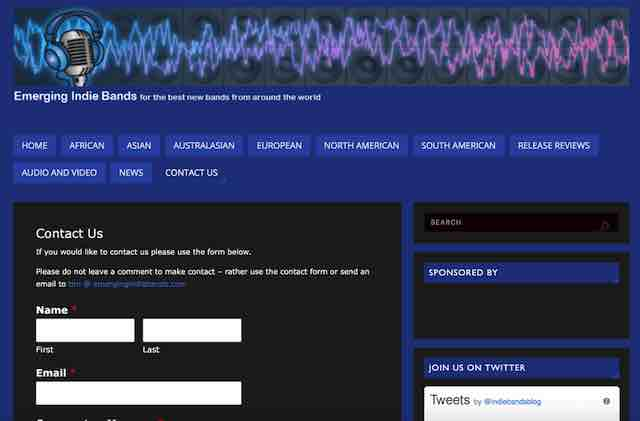 Kane FM started as a pirate radio station. 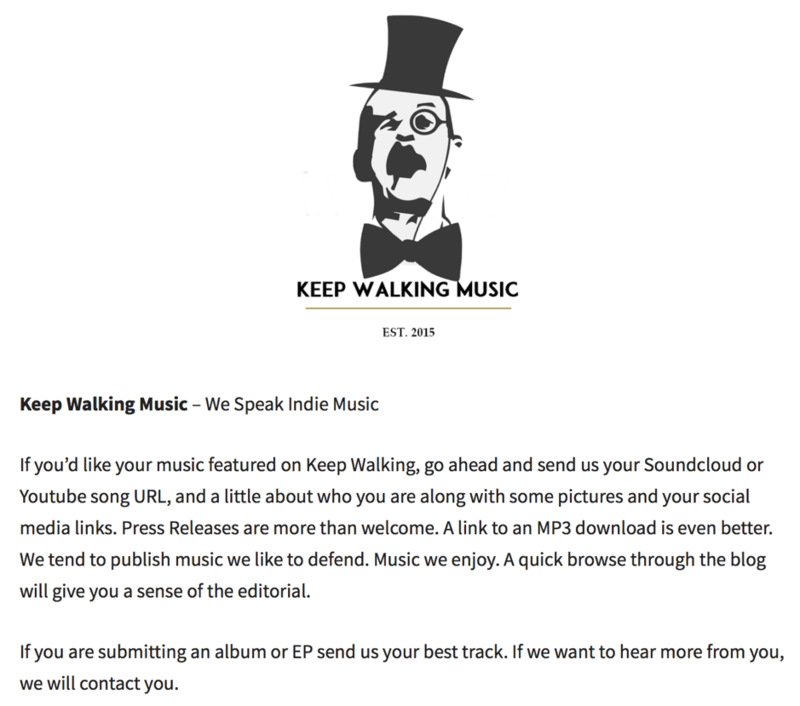 Keep Walking Music is a music blog based in Madrid, Spain. 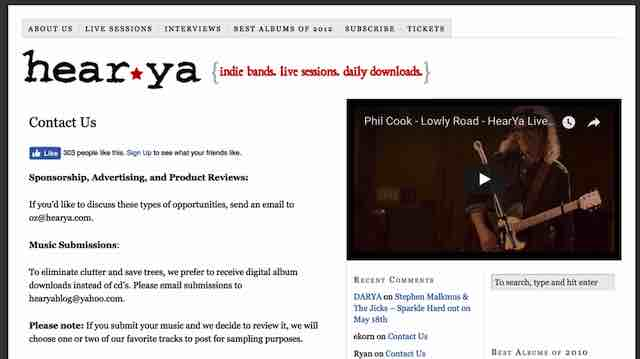 It offers reviews that aim at discovering excellent music. 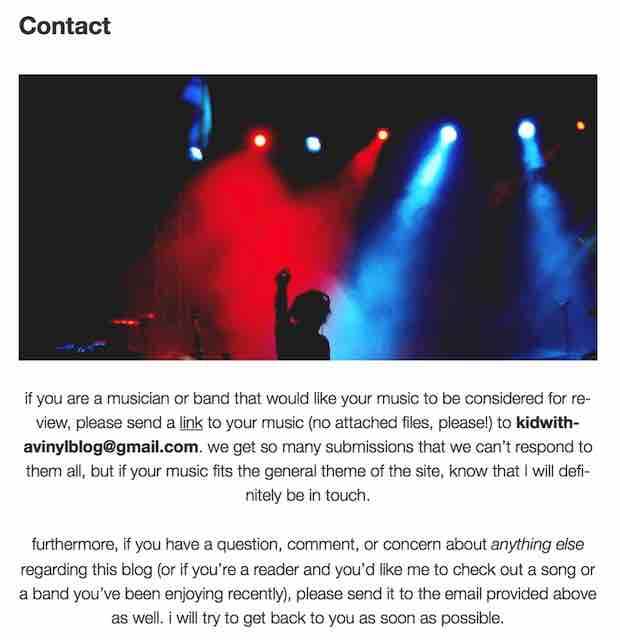 A music blog from Austin Texas, that covers the latest new music. 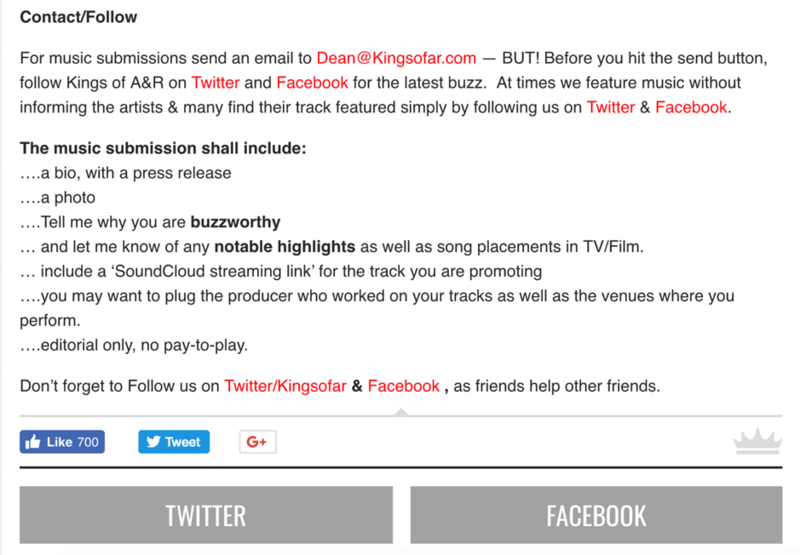 KOAR is dedicated to discovering emerging artists before they become well known. 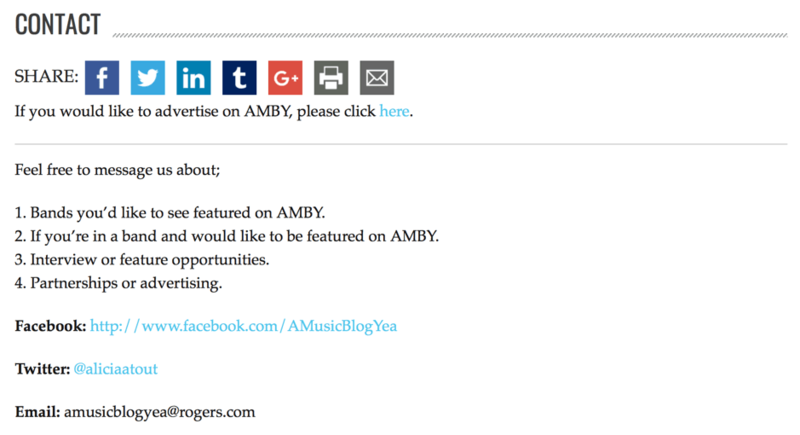 In the past, the blog has been selected as one of the top seventy five music blogs. It has been mentioned by various tastemakers. 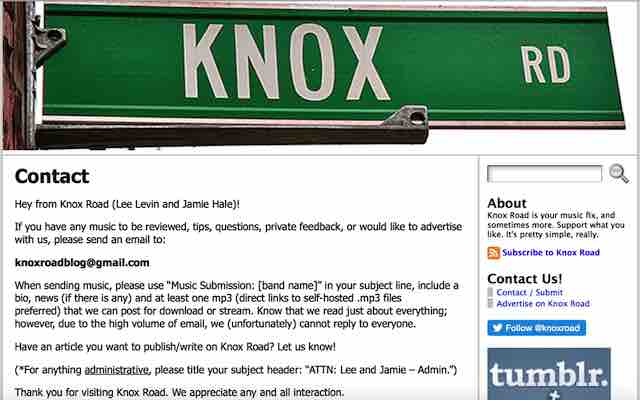 Knox Road is a music blog that features various types of indie music. 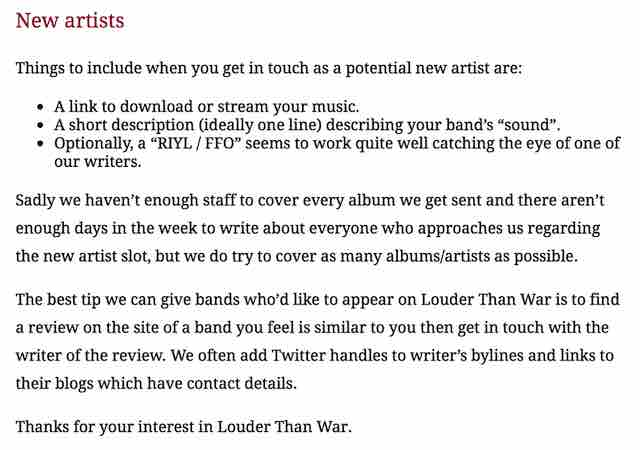 It is run by Lee Levin and Jamie Hale. 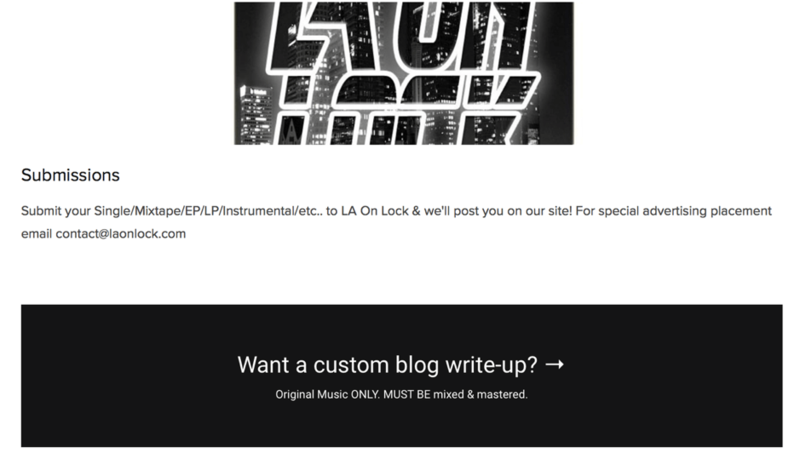 If you are looking for a great source for underground hype in Los Angeles, LA on Lock is a blog you should visit. 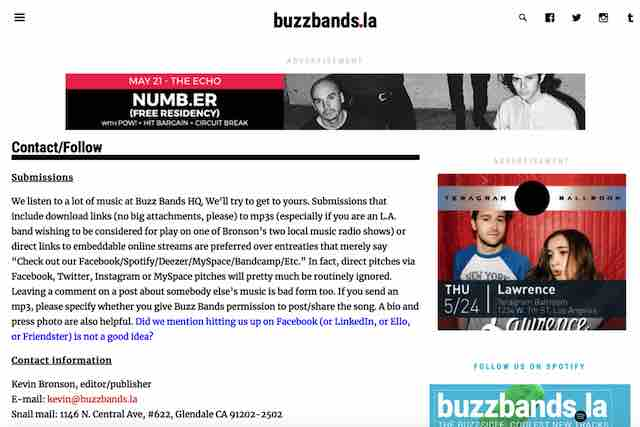 Their staff has been dedicated to cover emerging LA artists. 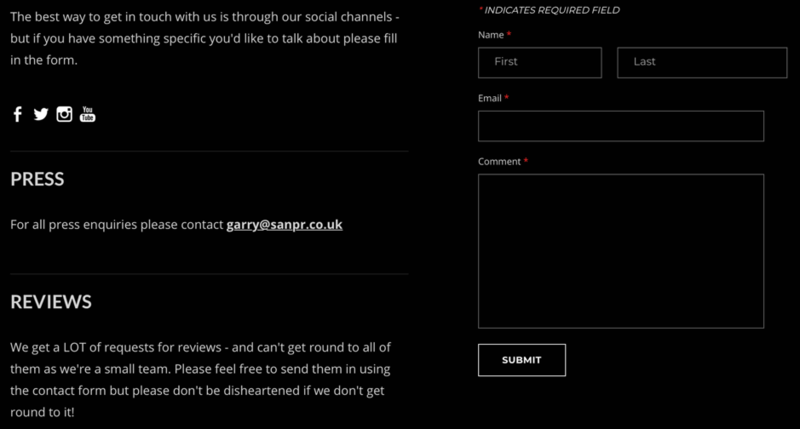 This is a UK based music blog where you can find lots of reviews of emerging indie artists. 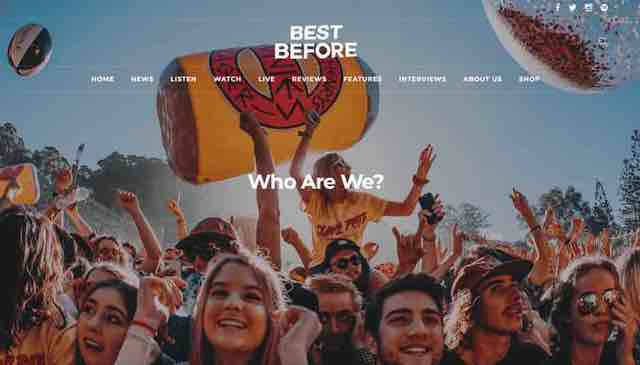 The site features a track of the day, a track of the week and a best new track section. 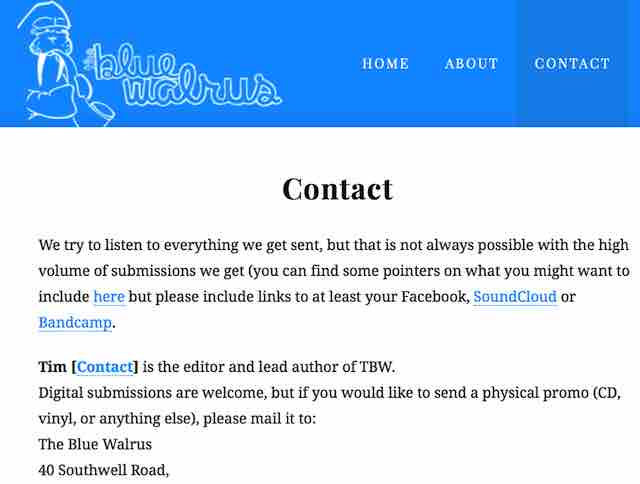 Justin Ward started Live Music Blog in 2004. Music to Curator brings forth music that is selected by curators. 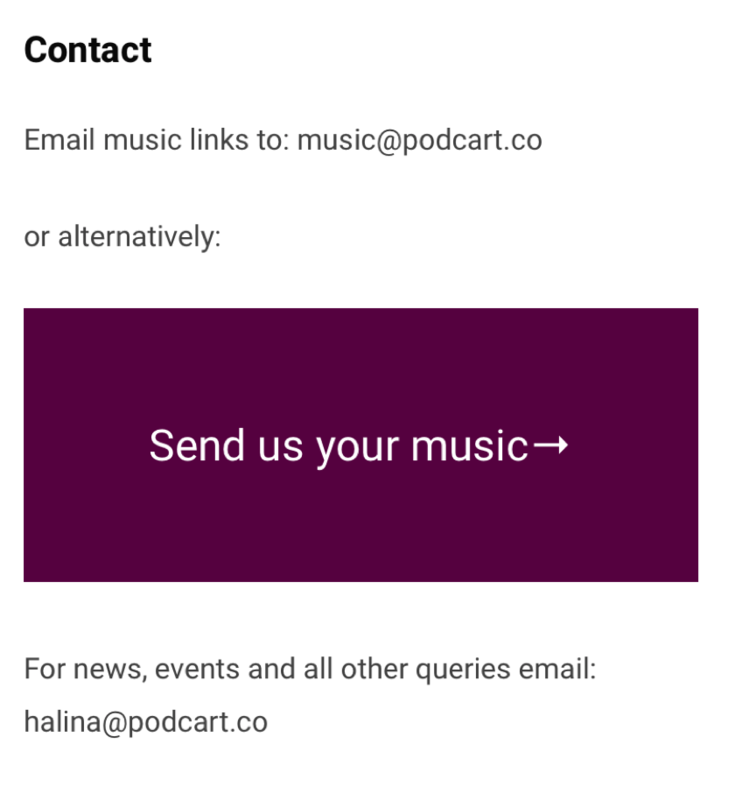 The curators running the site are from diverse backgrounds — musicians, moviemakers, barristers and baristas, DJs, digital marketers and more. 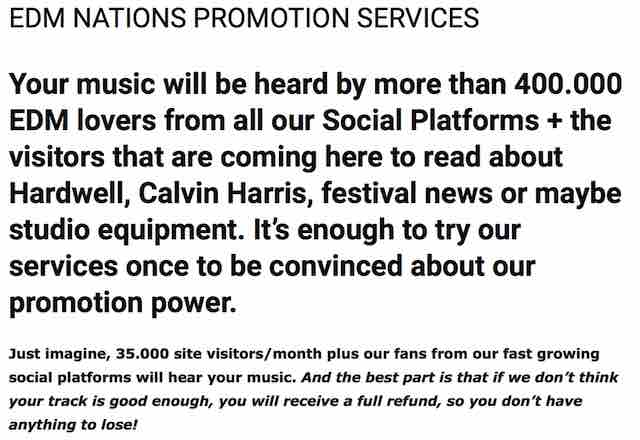 Every week they select one track, write an article about it, promote it on social media and add it to the Musicto playlists. 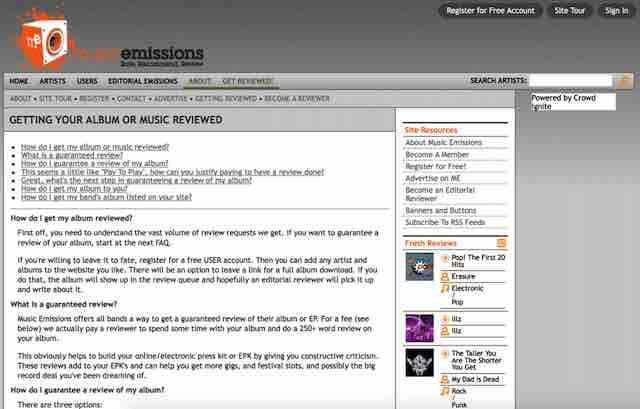 Once a college review site, Music Emissions has turned into a community that consists of about five thousand users that love indie music. 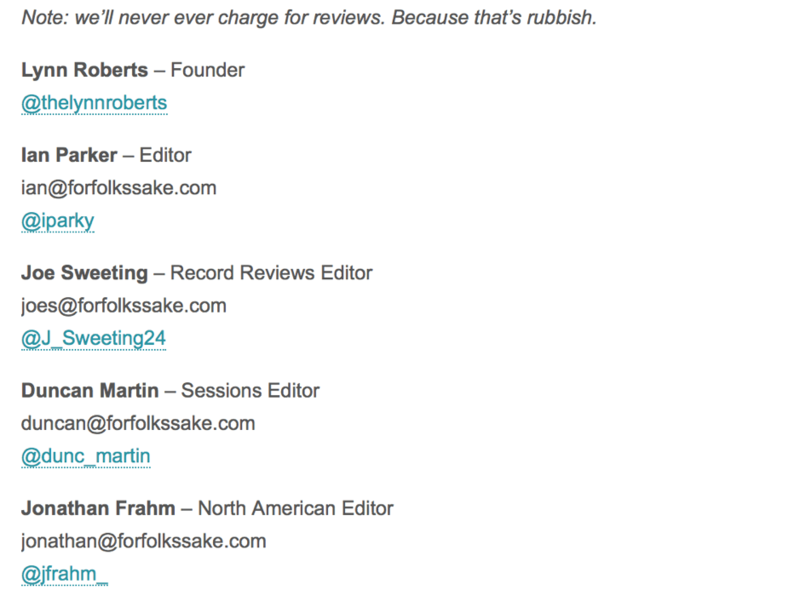 The many reviews on the site were created by reviewers from across the world. Music Emissions helps artists get discovered, and allows journalism students to express themselves. 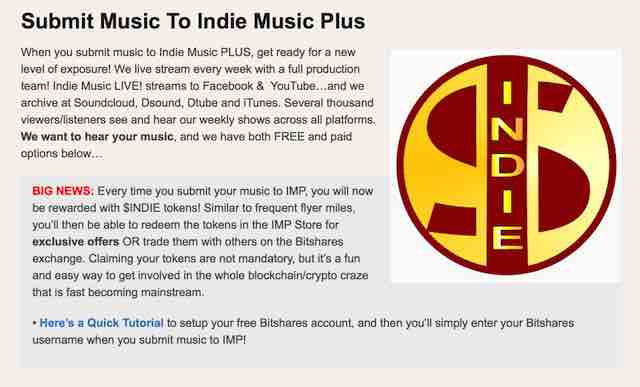 It gives indie music junkies a way to discover new music. Genres: Rock, Blues, R&B, Jazz, Pop, and Soul. 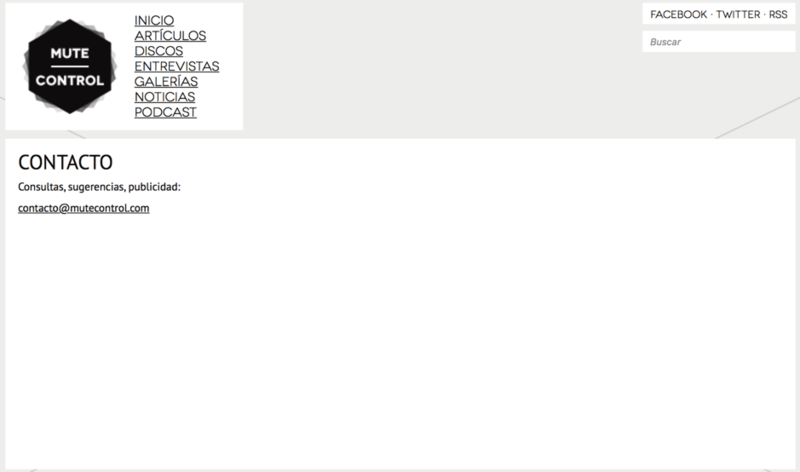 If you can read Spanish and you like Electronic music you’ll love Mute Control. 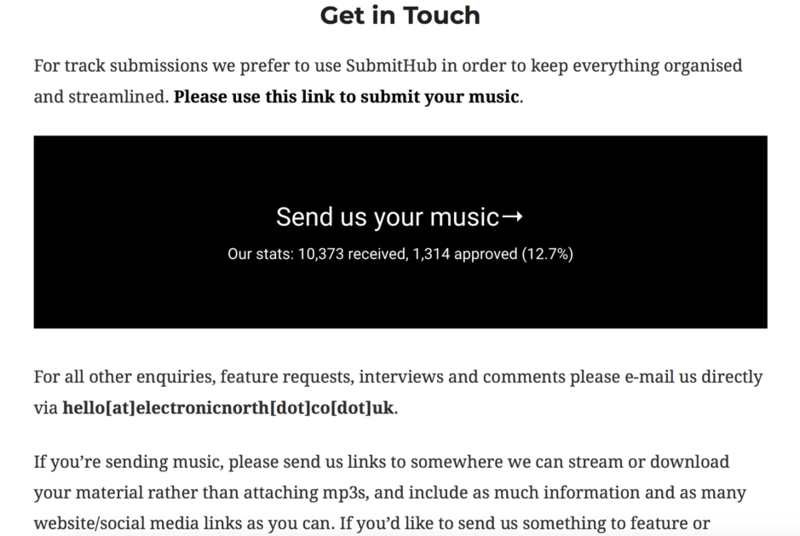 This is a music blog in Spanish that covers Electronic music. 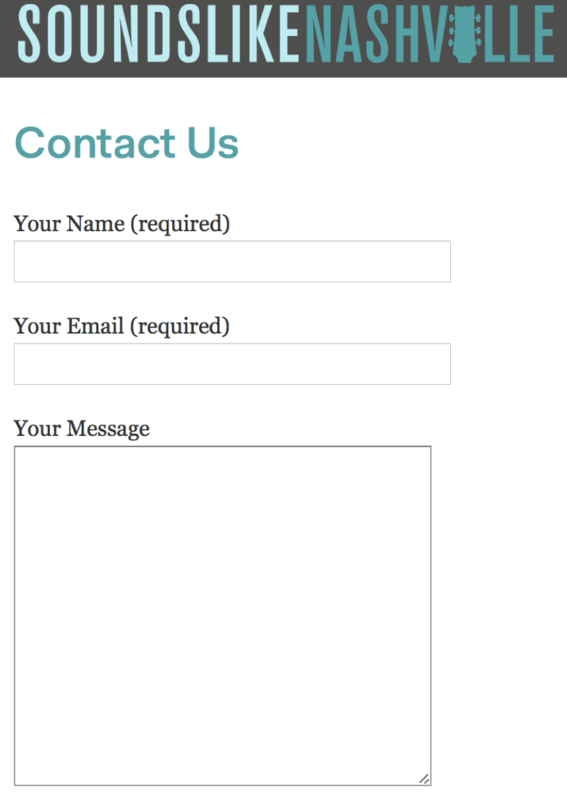 Mystic Sons is a promotion company that is based in London. 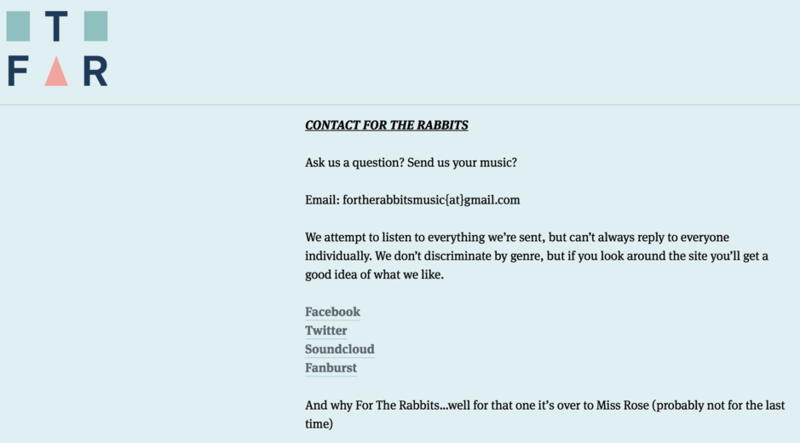 They strive to bring you the newest music from around the world. All artists are welcome. As long as the music is good, Mystic Sons don’t care if the artist is a unsigned or an established artist. 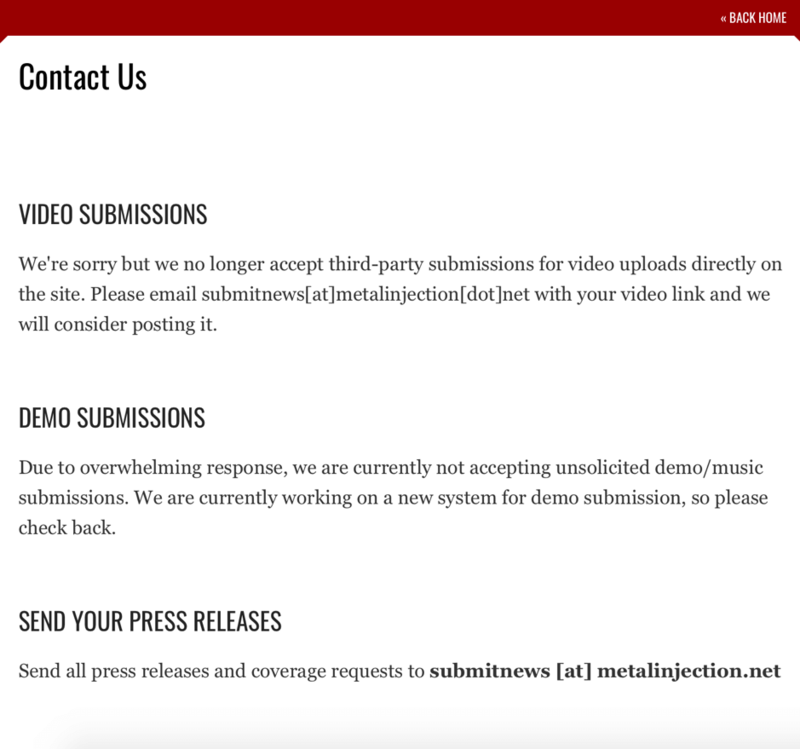 Run by Robe Robert Pasbani and Frank Godla, this blog is packed with articles featuring Heavy Metal artists. 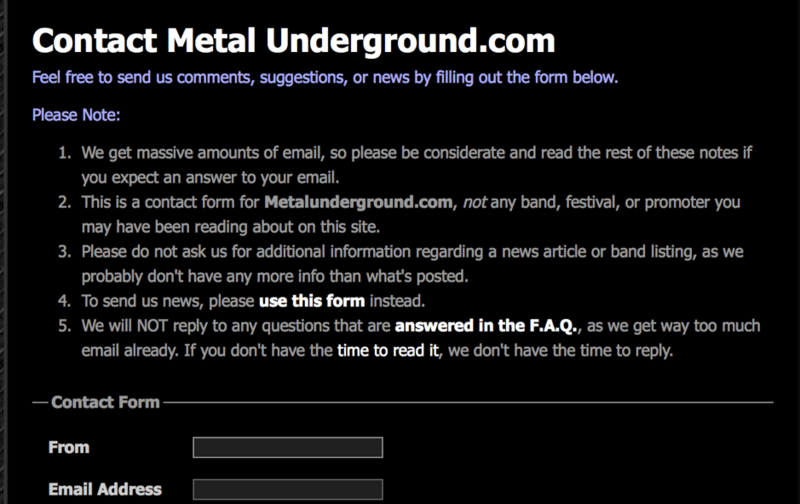 Besides that, the site has original videos, interviews and podcasts. 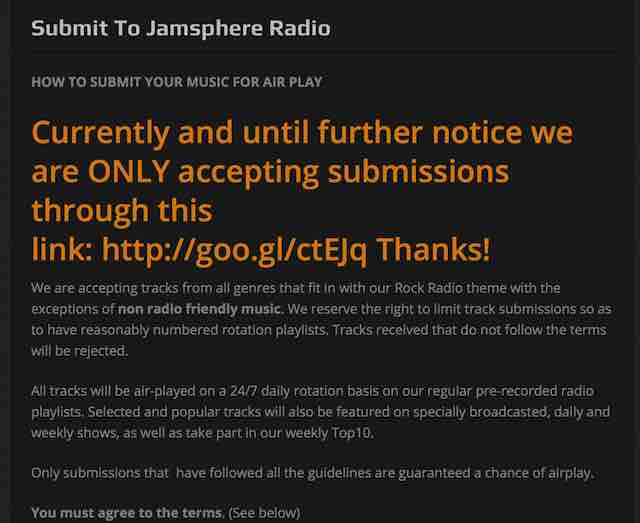 Note that they do not accept unsolicited demo/music submissions. 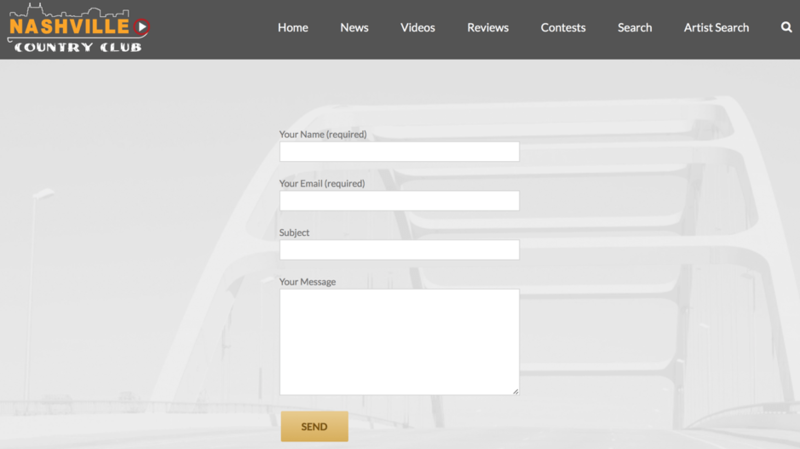 However, they are currently working on a new system for demo submission. Moonlith Cocktail is a music blog run my Dominic Valvona. What makes Moonlith Cocktail unique is a very eclectic playlist selection that spans different genres from different eras from across the world. 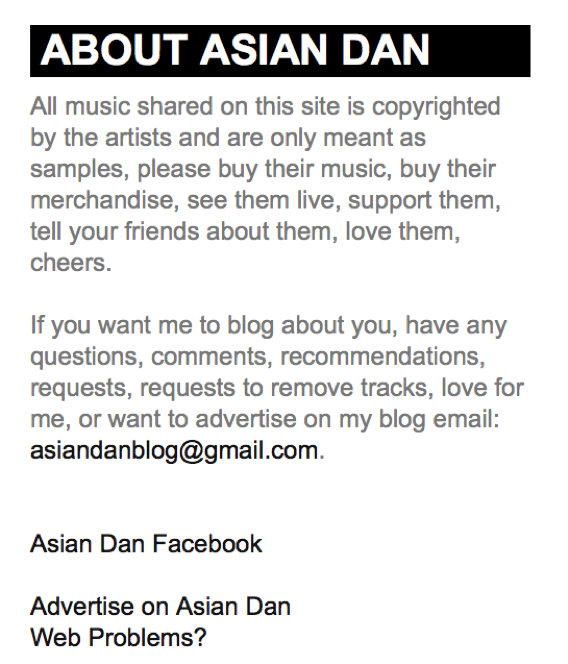 Music That We Like is based in Beijing, China. Noonday Tune has been around since 2011. 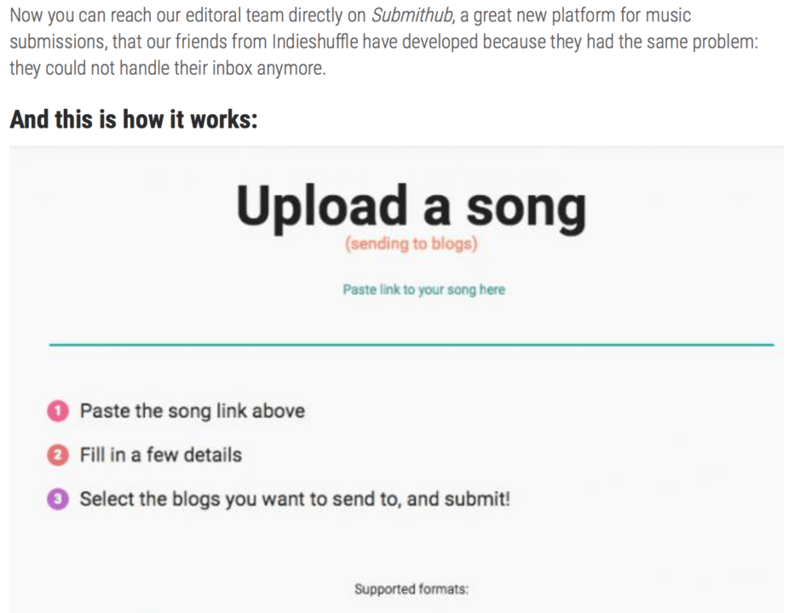 Its editors share music that they are into and publish only one new song a day. 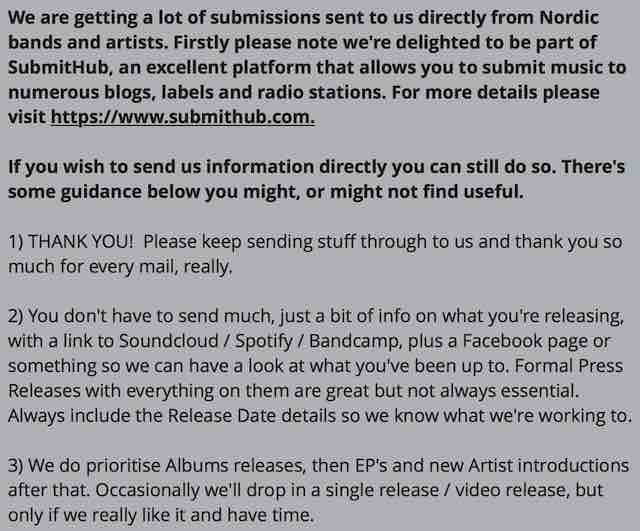 Nordic by Nature is a music blog based in Berlin. 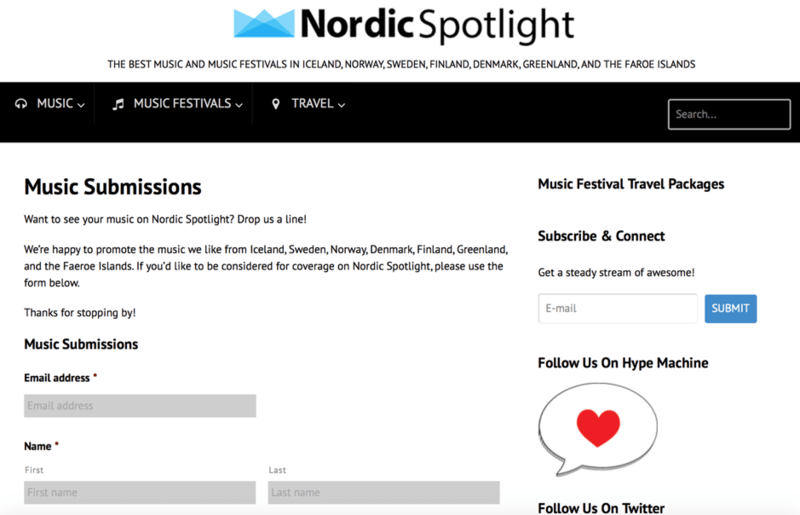 Nordic Spotlight is a music blog that started in 2011. 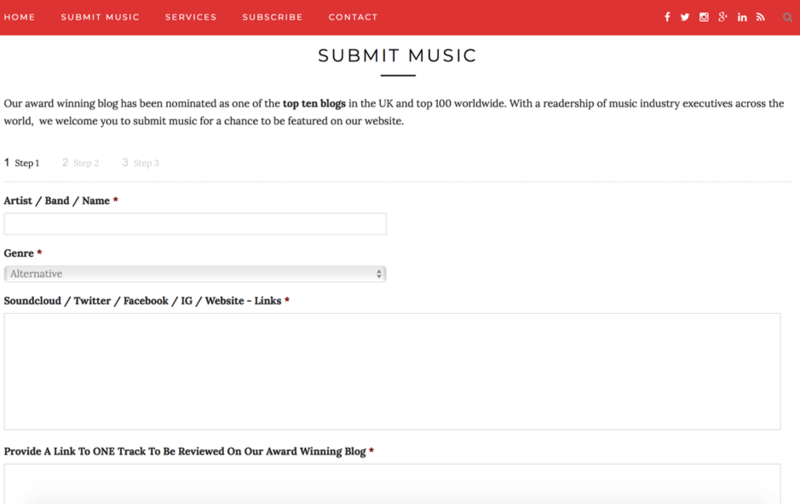 The blog’s team of writers focuses on the best music from Denmark, Iceland, Norway, Sweden and Finland (also Greenland and the Faroe Islands). 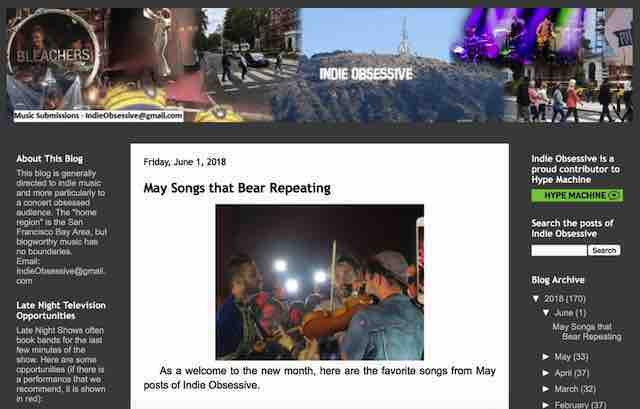 Obscure Sound is an indie music blog that was established 2006 by Mike Mineo. 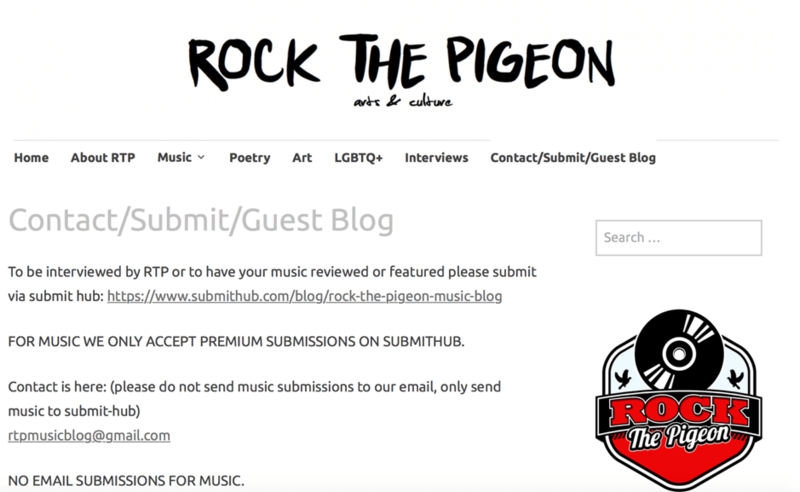 Mike formed the blog because he loves discovering new and emerging quality music. 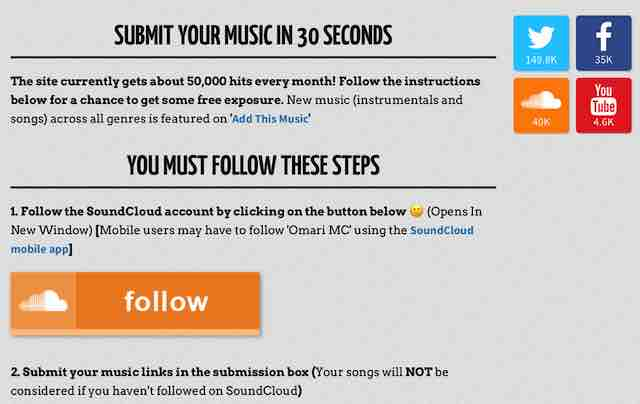 The purpose of the blog is to provide music fans with the latest and greatest music. 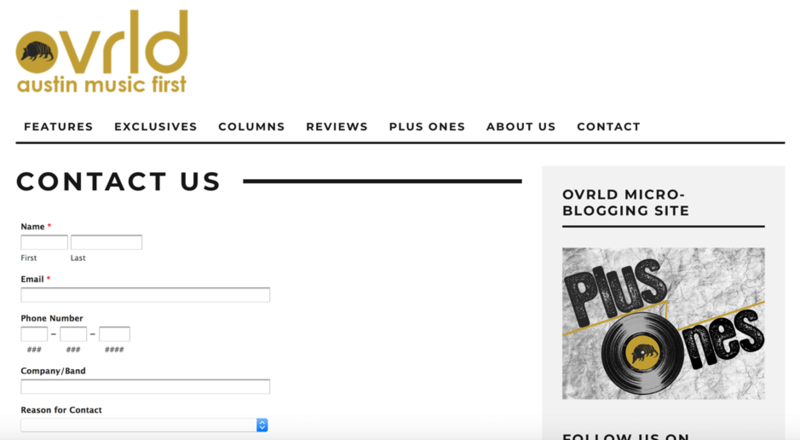 Ovrld (or short for “overload”) is a blog run by music fans from the United States. It is based in Austin, Texas, United States. 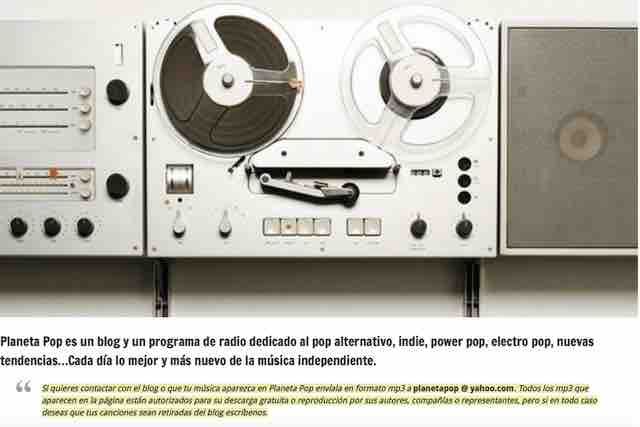 Here’s a cool blog in Spanish that features a radio program dedicated to alternative pop, indie, power pop and electro pop. 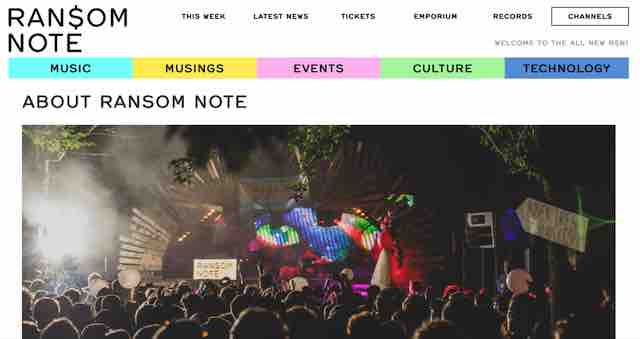 Popjustice is a music blog that was established by music journalist Peter Robinson in 2000. Robinson claims that he likes music with drum machines and sad-sounding singers. When you enter POPMUZIK don’t be intimidated by the Swedish language. Scroll down and you’ll see English. 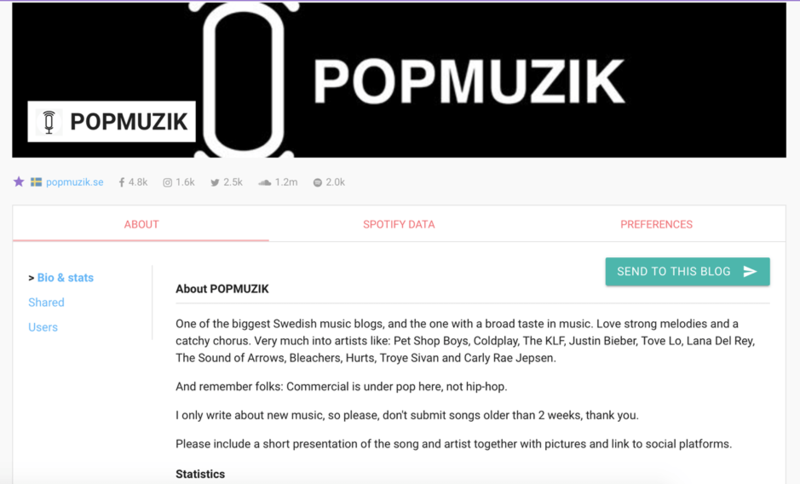 POPMUZIK was formed by Stötta bloggen and is one of the biggest Swedish music blogs around. Stötta loves music that sounds like Pet Shop Boys, Carly Rae Jepsen, Taylor Swift, Tove Lo or Justin Biber (don’t submit hard rock and hip hop). 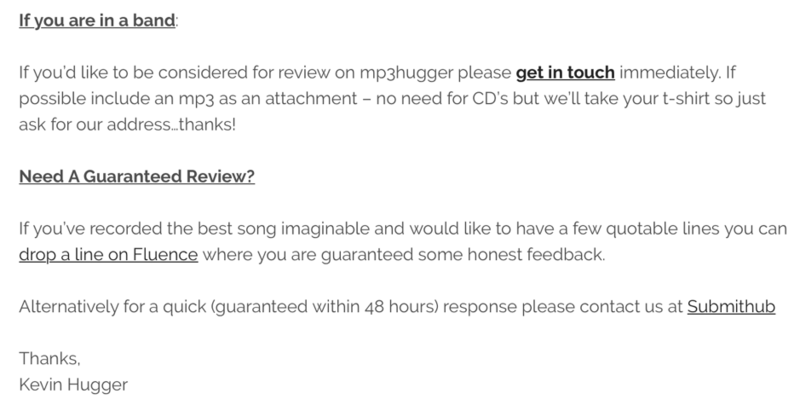 Notice that he only accepts new music. 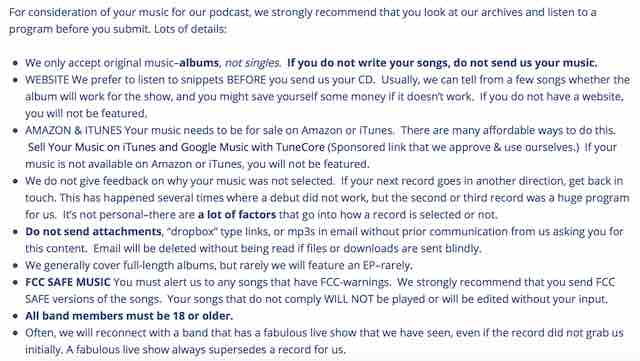 Music that is older than 2 weeks is not accepted. 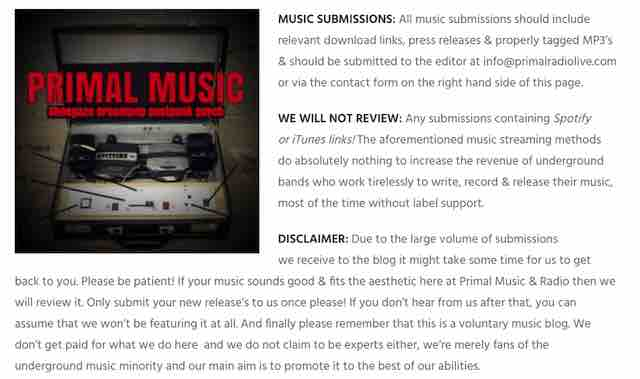 Primal Music Blog is a music blog based in Ireland. 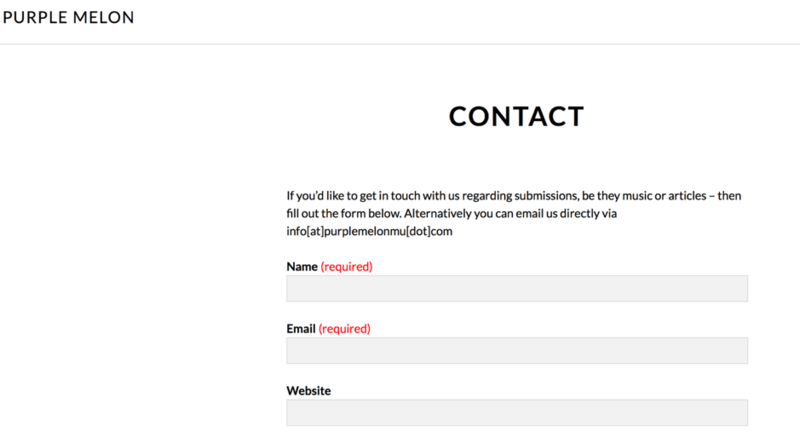 Purple Melon Music was founded in 2014 by Lex Low and Eddy Atlantis. Enter the blog, and you’ll see a gallery of beautiful artist photos. 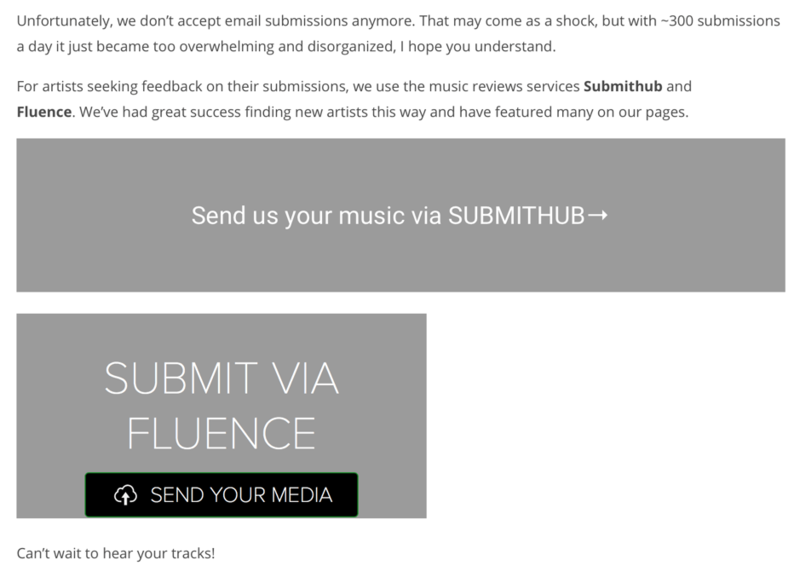 Rave Reviews is a music blog that covers rave and electronic music. 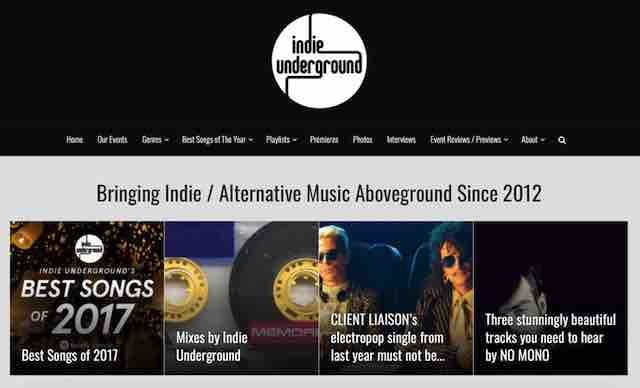 Tom Sullivan, Andy French and Mike DeSutter founded Raven Sings the Blues in 2006 when they were employed at Insound.com, an indie vinyl site (Insound.com no longer exists). 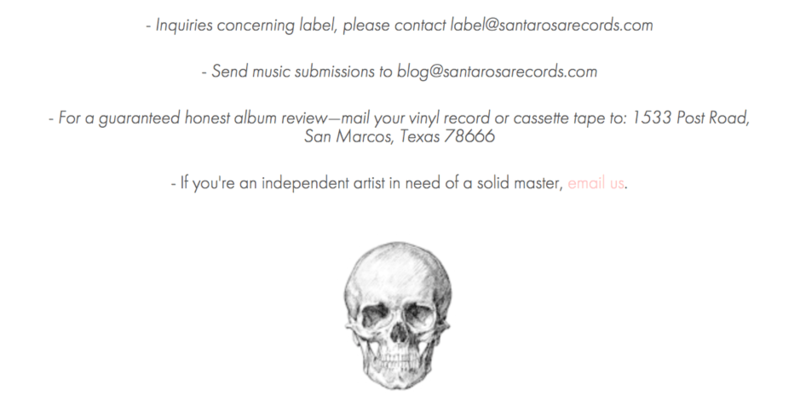 Santa Rosa Records is an indie label and publishing company. 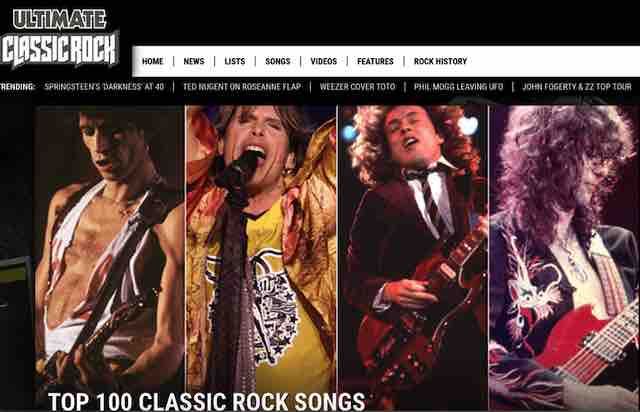 The site features sections that cover vinyl records, cds and cassettes. 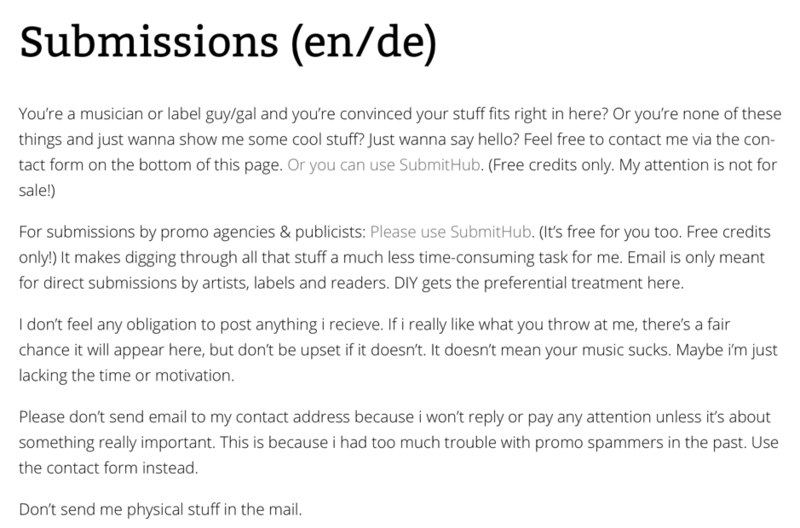 This is an Indie-Pop/Electro-Pop blog. 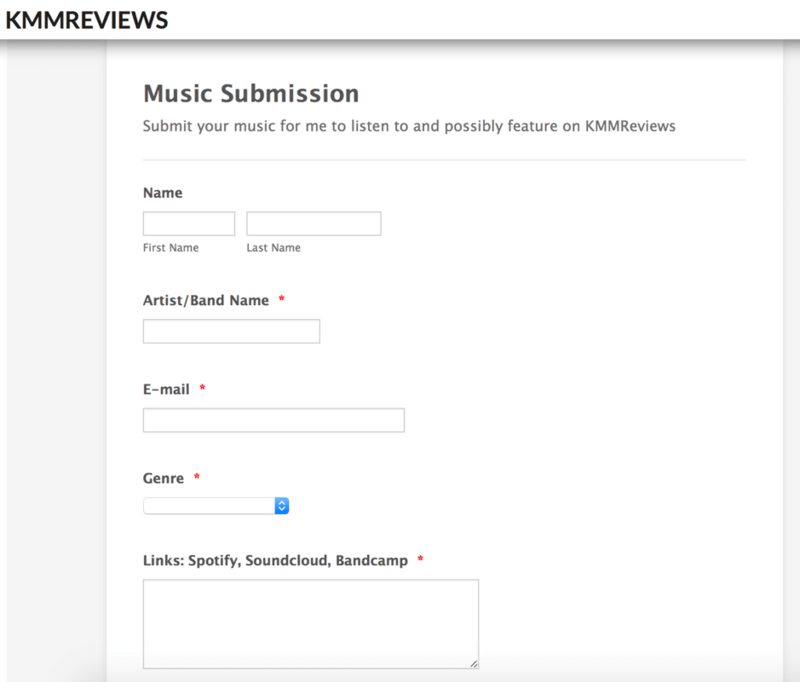 Enter Sidekick, scroll down and you’ll see a “Submit Your Music” section. 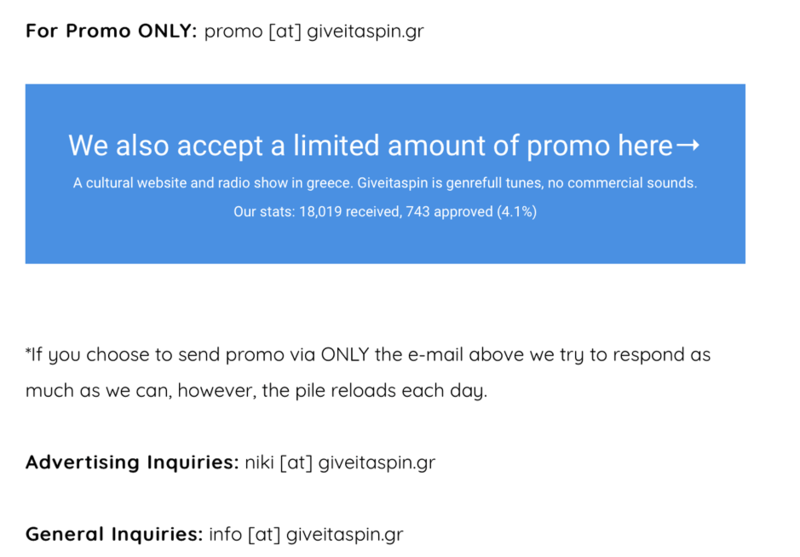 This record label and an internet radio station focuses on electronic music. 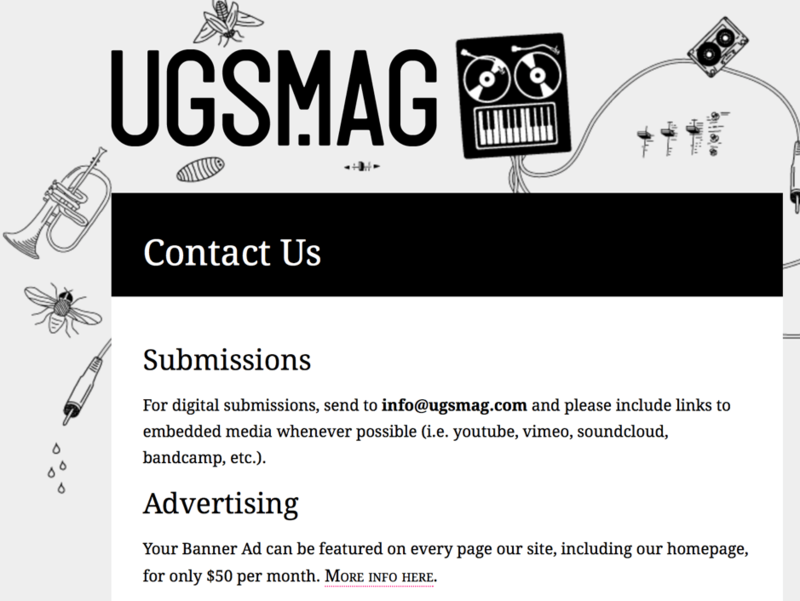 It features interesting articles on various artists. 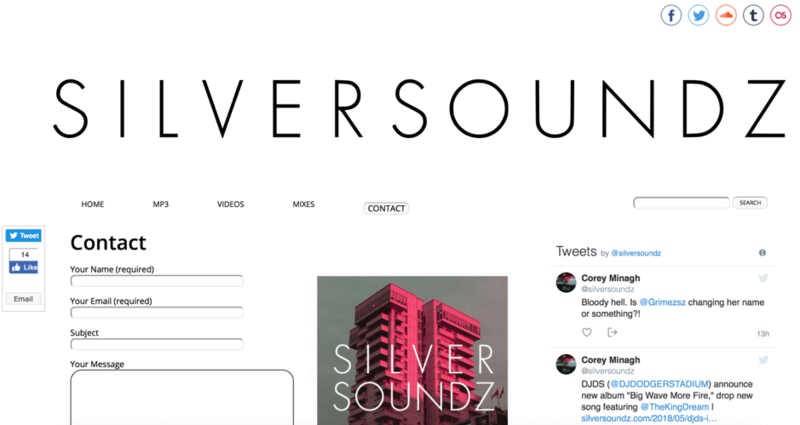 Check out Silver Soundz for interesting articles on electronic music. 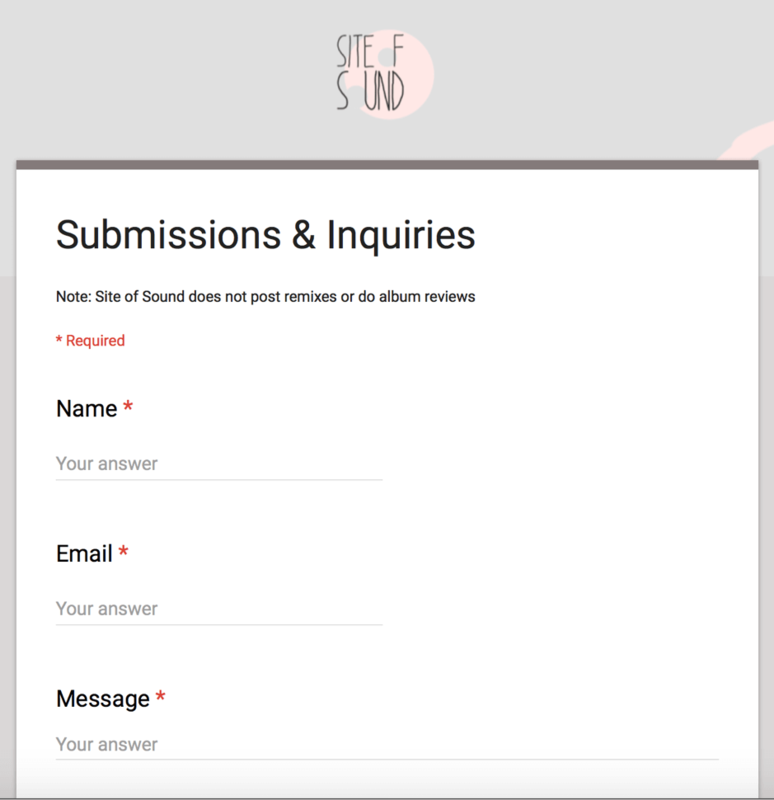 The Site of Sound is an independent music blog that started in 2009. Sodwee stands for “Sounds of Da WEEk”. 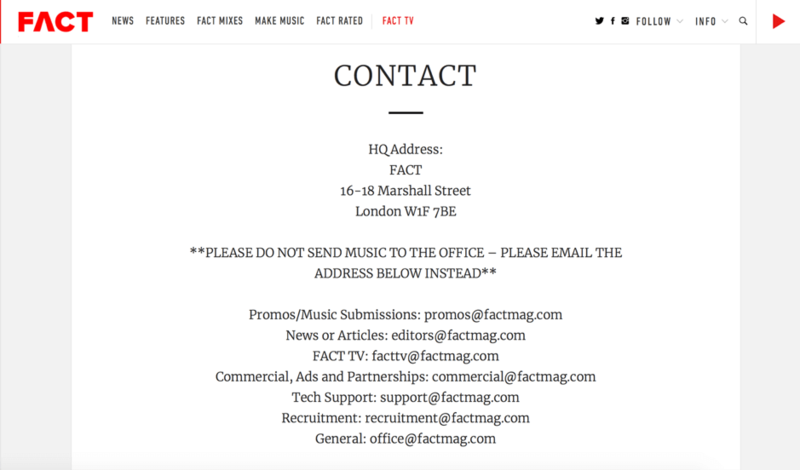 It was formed in 2006 and is run by Ben, who works for Get In!, a well know PR agency that promotes DJs. Ben presents new tracks and videos every week. Surviving for the Golden Age, or StGA started in 2005. 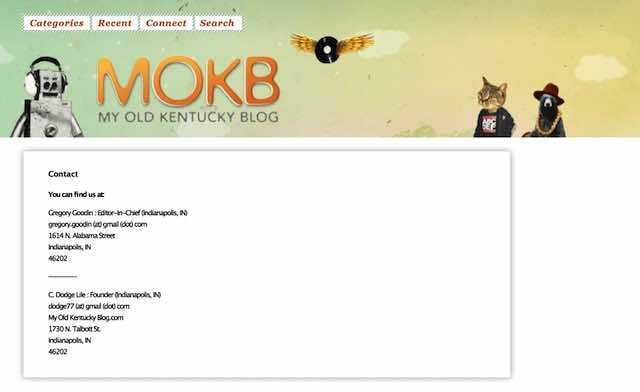 Since 2005, it has turned into a very interesting blog that covers a wide range of genres. 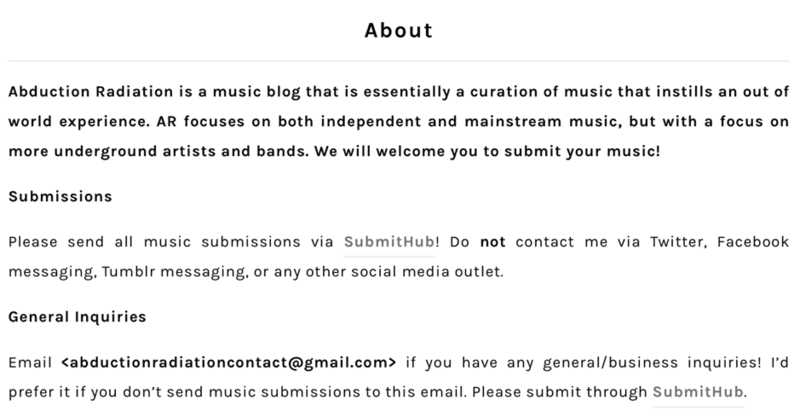 This music blog was founded in 2014. 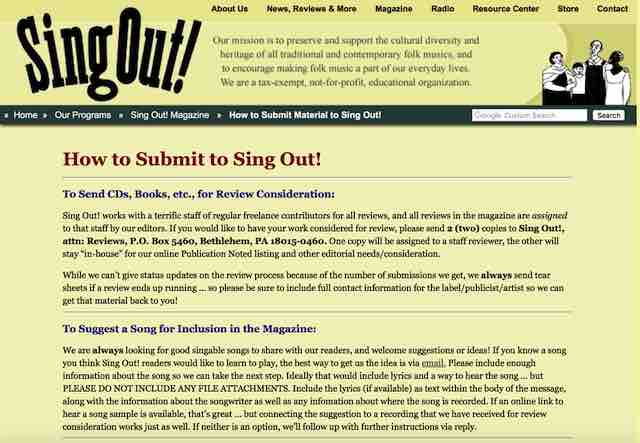 Although its writers mostly cover alternative, indie, and dance, they claim that anything goes as long as they like it. 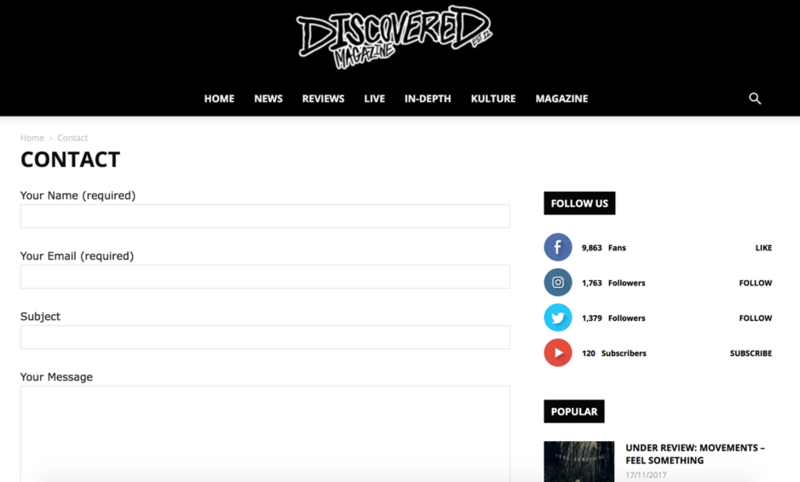 The blog’s most important sections is called “Discover”. 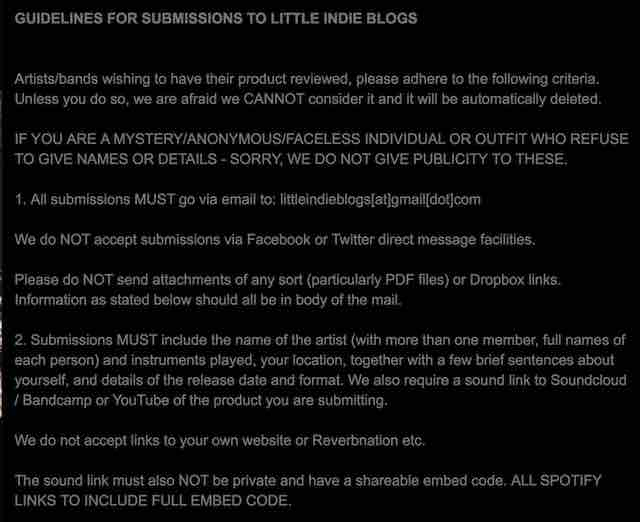 The Grey Estates is an indie music blog that was founded by Lauren Rearick in 2013. 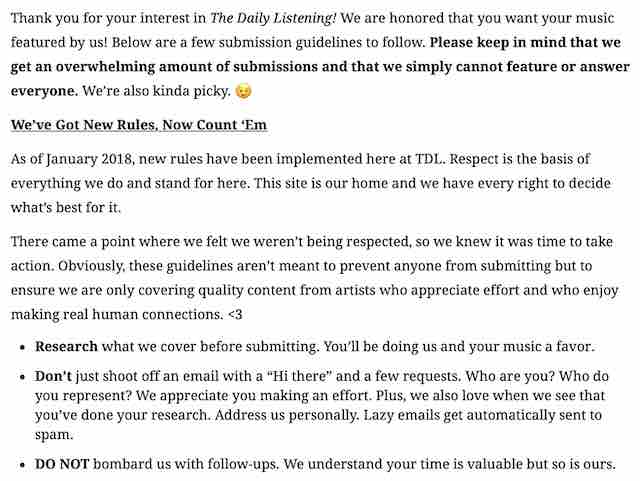 It has a newsletter and a podcast. 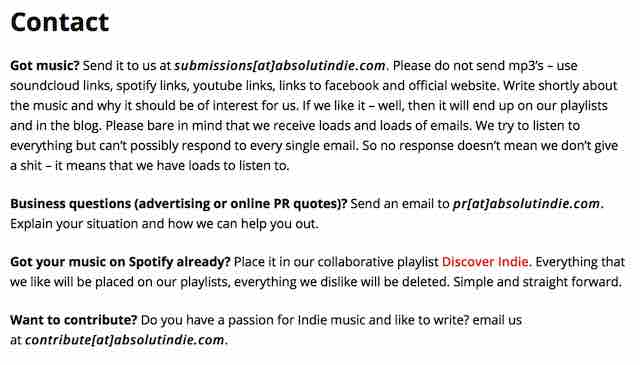 The Indie Sound is run by a group of passionate writers that strive to promote both established and emerging artists. 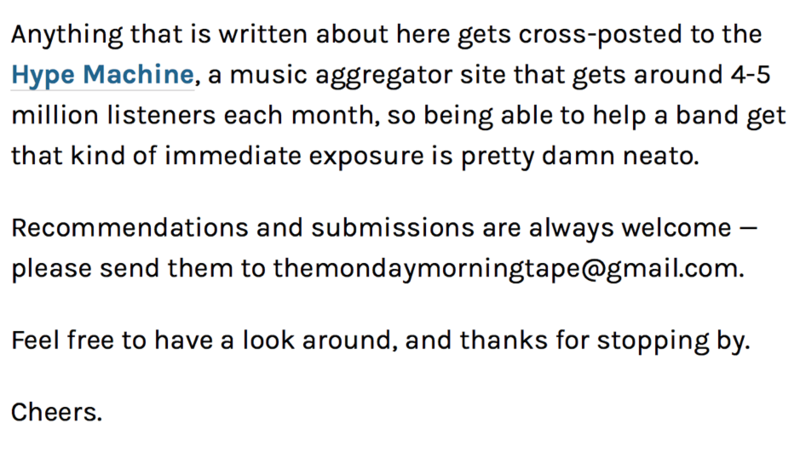 The Monday Morning Tape is a music blog that aims at encouraging music recommendations and discussion. The Walk to Work’s editors discover new music when they are on their daily commute into work. 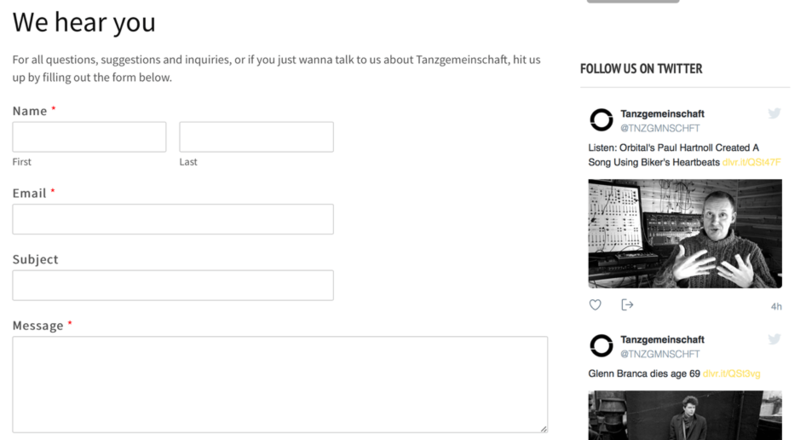 Tonspion is one of the biggest music blogs in Germany. It was established in 1999 in Berlin. 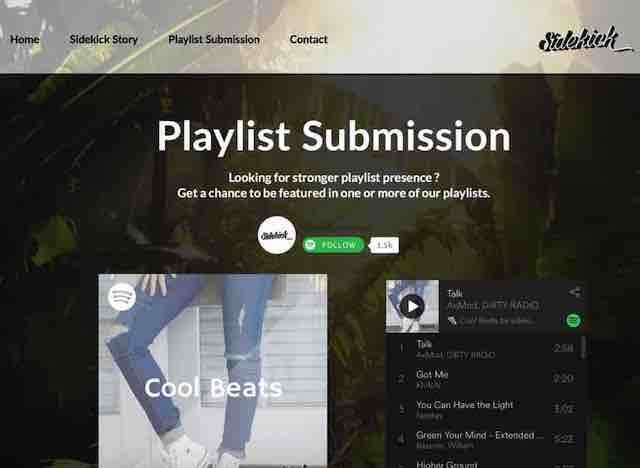 It focuses on discovering and promoting new music. Most of its team is made up of musicians. 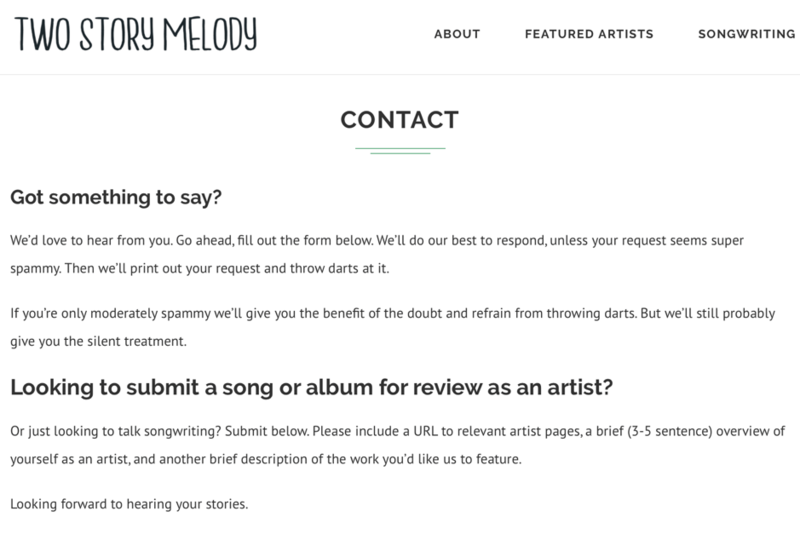 Two Story Melody is a music blog about the art and craft of songwriting. The reason that Two Story Melody exists is because its creator, Jon wants to understand how amazing artists make great music. 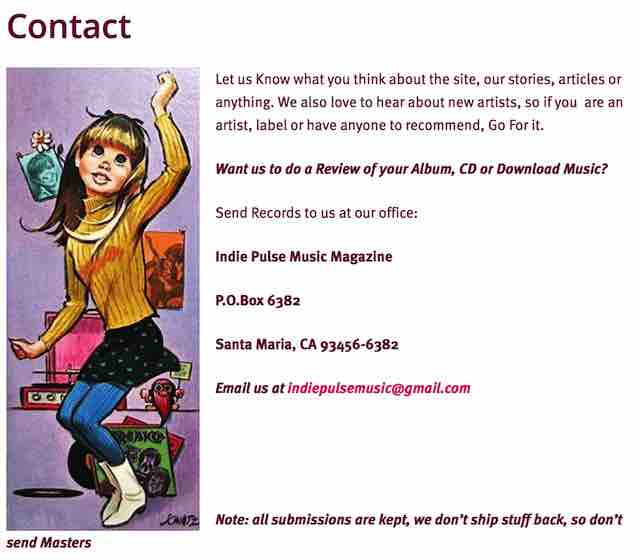 Under The Radar is an indie music magazine that was established in 2001 by Mark Redfern and Wendy Lynch. 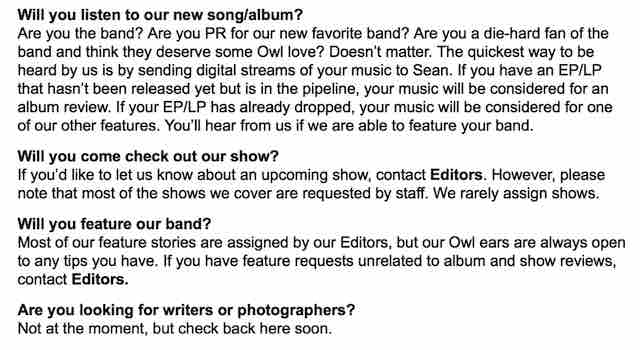 It is known for its in-depth interviews with all types of bands. 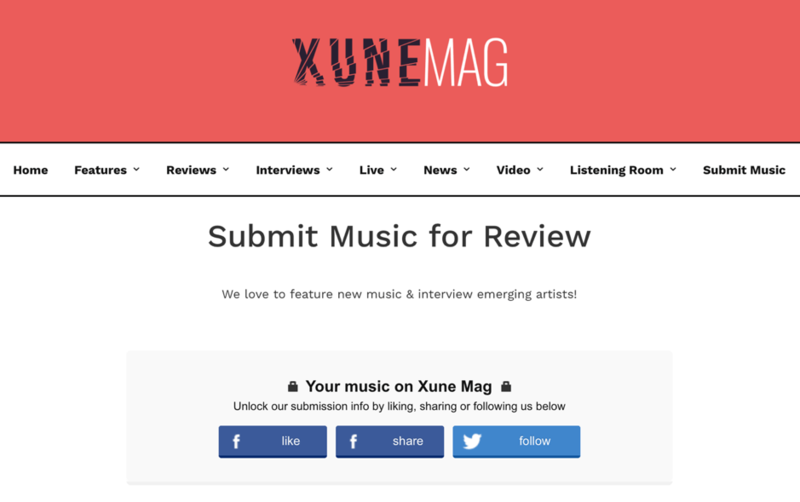 Xune Mag is a music discovery blog and the perfect place to visit in order to uncover lots of independent and emerging artists from across the world. 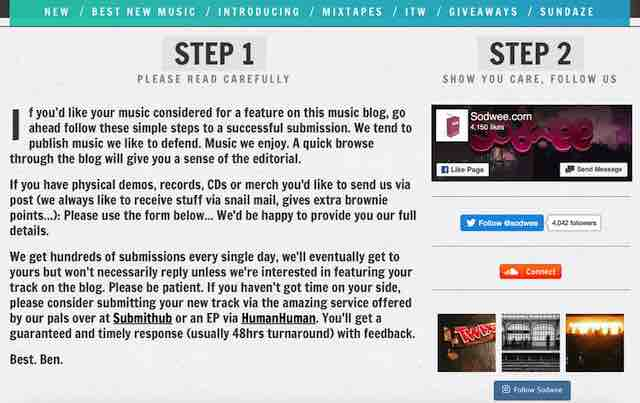 The site includes song reviews, music news, interviews with artists and featured videos. 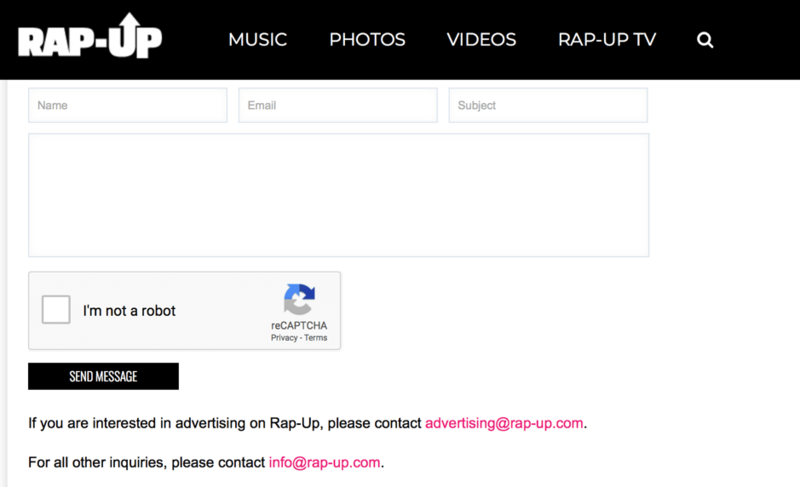 XXL Mag is an American Hip Hop magazine that was founded in 1997. If it be your will has recently celebrated 10 years of existence! 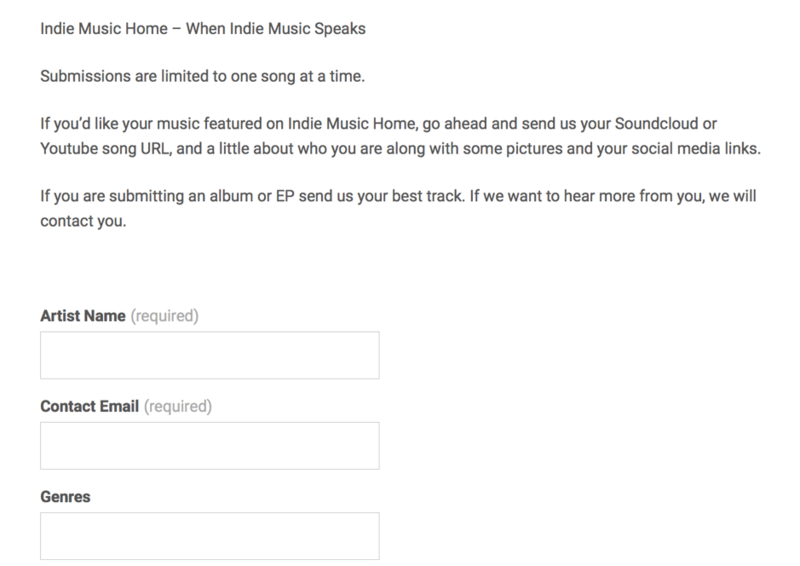 This a very cool Indie blog explores and promotes unique and original Indie music. 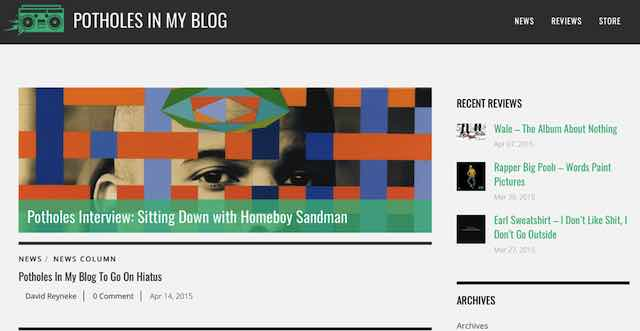 The music featured on the blog is eclectic and intriguing. That’s quite a long list. 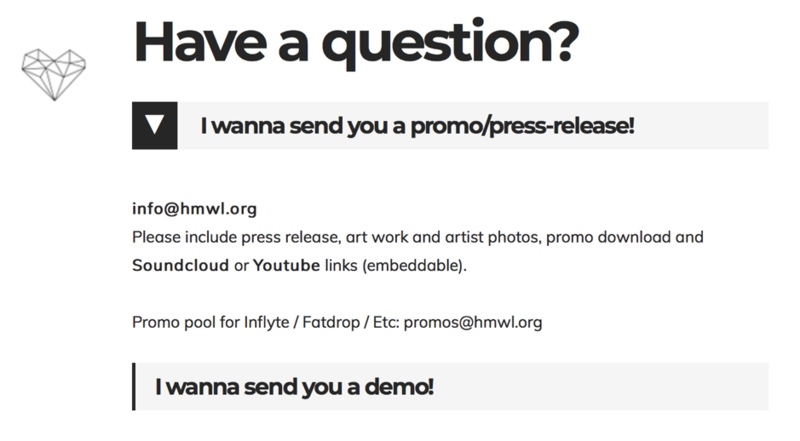 Which music blogs interest you? 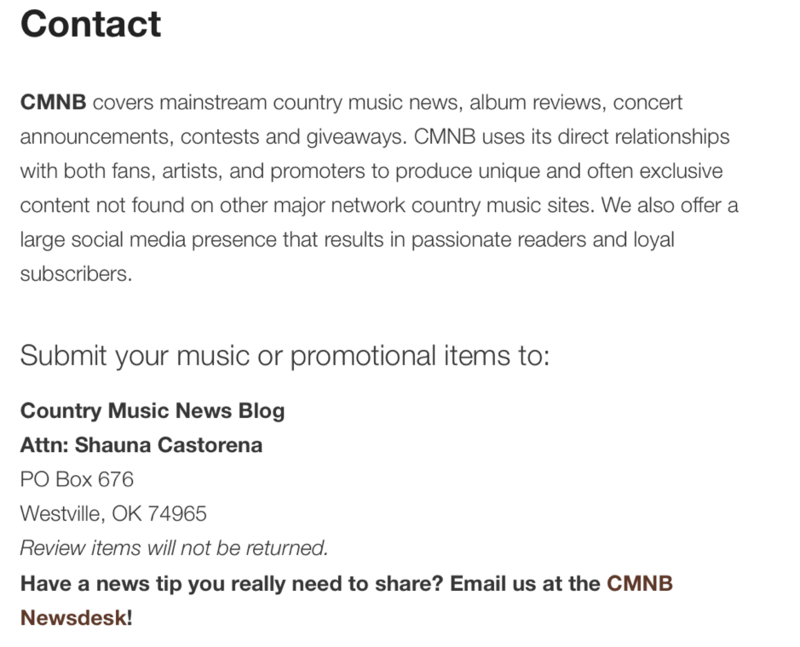 Do you know of any music blog that I should add to the list? 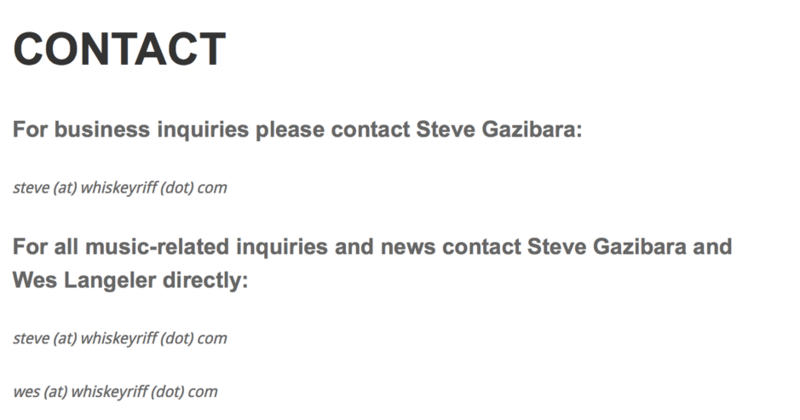 Have you found any information in this post that needs to be updated? Either way, let me know by leaving a comment below ↓ .